One for the road. 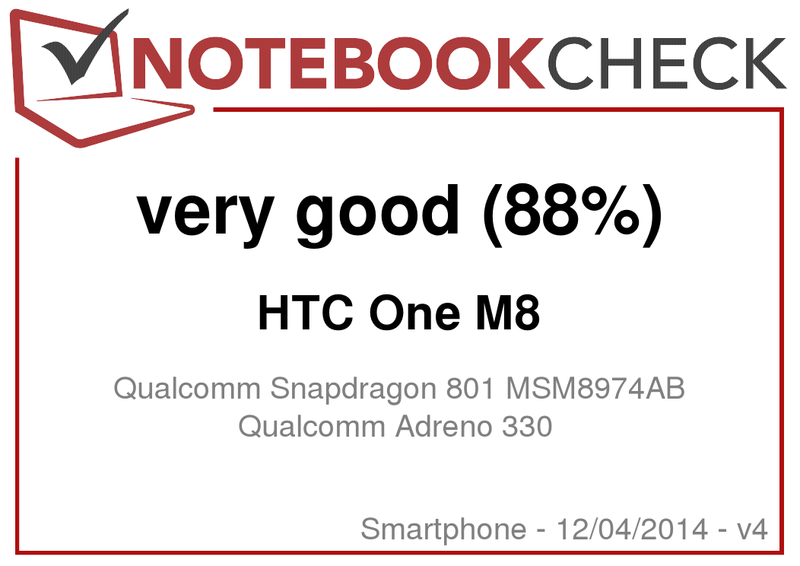 It is once again time for new high-end smartphones and we start with the review of the HTC One M8 with the brand-new Qualcomm Snapdragon 801 SoC. We could read many things before the launch: Sturdy unibody chassis, low-resolution Duo camera, cheating during benchmarks. Read the whole truth in our in-depth review. HTC started its business with smartphones and managed to get some breathing room in the crisis with the high-end device HTC One in 2013. 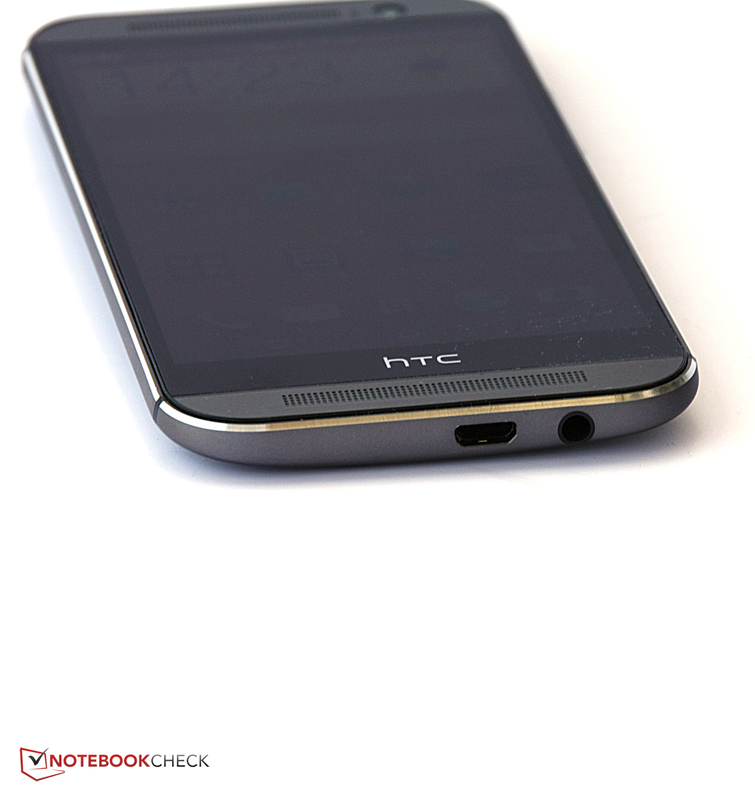 With stereo speakers at the front and the cooperation with Beats, the HTC One was an excellent smartphone for music enthusiasts. Now they launch the second generation, and this time HTC has a slightly different focus: The cameras at the back are now the main attraction. Cameras? Yes, there are actually two lenses at the back of the metal case: One module takes the pictures, while the other one provides a fast focus and captures depth information of the picture. 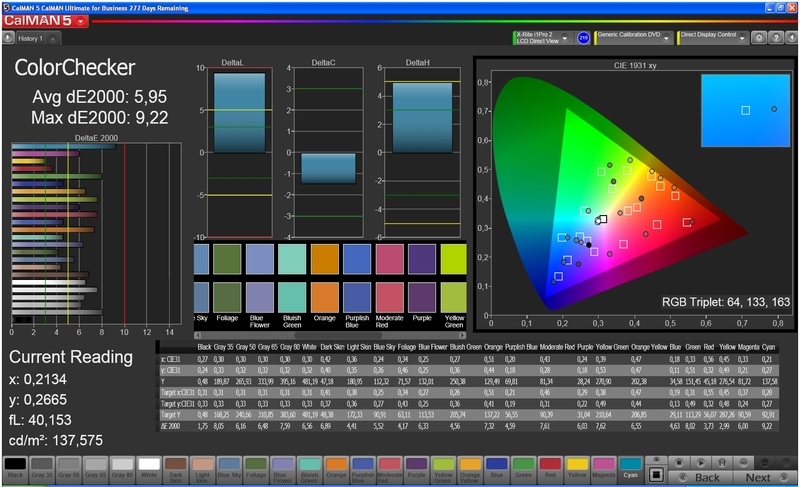 With this information you can edit single objects, shift the focus and use other features. The two cameras are an innovative feature, but the high-end market demands a lot from a smartphone. HTC integrates the new SoC Qualcomm Snapdragon 801 MSM8974AC to provide sufficient performance. Some showing-off is certainly necessary since the device has to compete with high-end rivals like the Apple iPhone 5S, Google Nexus 5, Sony Xperia Z1, Samsung Galaxy S4 or LG Optimus G Pro, all of which offer some high-tech features. 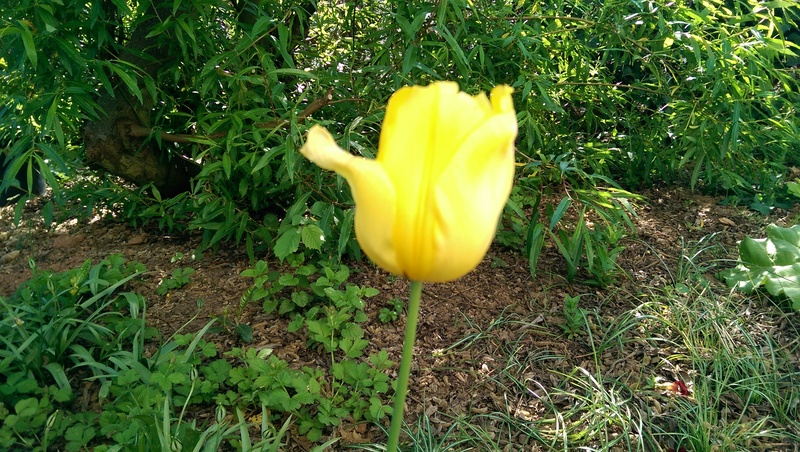 Nokia also has a high-end smartphone with the Lumia 1020 that is equipped with an extremely high-resolution 40 MP camera and numerous features. Samsung Galaxy S5 and Sony Xperia Z2, two devices from the new generation of high-tech smartphones, are in our editorial office as well, so we will compare these three devices in an article soon. Ergonomically shaped, sturdy and made of metal: The case. We reviewed the predecessor more than one year ago: We really liked the aluminum case, but it consisted of two parts. 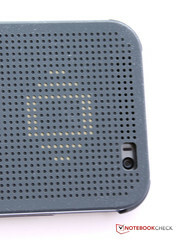 HTC improved this detail on the new One M8 and now uses a real unibody case, which accommodates the SoC, the display and all the other parts (glued into the case). 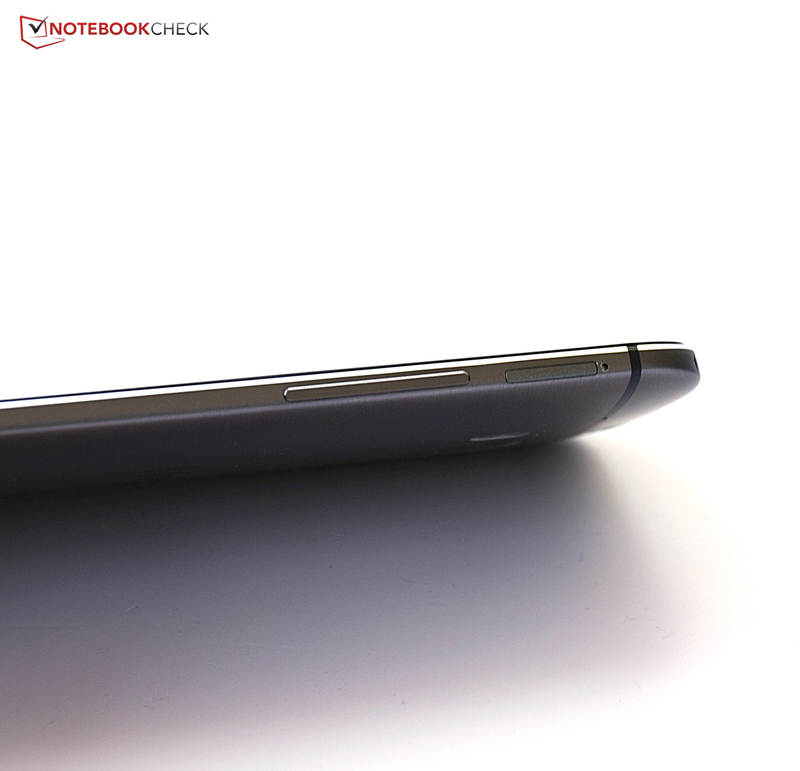 And the One M8 is not even particularly thin: At 9.35 millimeters (~0.37 in), it is significantly thicker than the iPhone 5S, Google Nexus 5 or the Sony Xperia Z1, and even slightly thicker than the predecessor. Weighing 160 grams (~0.35 pounds), it is also slightly heavier than the HTC One from last year and significantly heavier than the Apple iPhone 5S, Google’s Nexus 5 and the Samsung Galaxy S4. However, this does not mean that the HTC One M8 does not feel good when you hold it – quite the opposite: Contrary to the HTC One M7, the manufacturer decided to use a curved back that provides comfortable haptics. The larger dimensions of the smartphone compared to the predecessor are therefore hardly noticeable. The very sturdy metal case cannot be twisted at all and looks very nice. 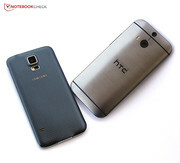 HTC offers the One M8 in three colors, although only silver and the darker gray are available at launch; the golden version should follow soon. The design of the HTC One M8 with the brushed aluminum, the rounded edges and the curved back is very appealing. HTC really did a good job, and in combination with the good haptics and the high stability, you really have the feeling you are using a high-end smartphone. 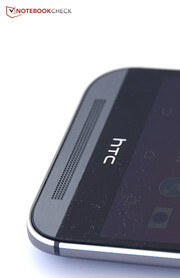 HTC improved the connectivity compared to the One M7: The storage can now be expanded via a micro SD card slot. However, the internal storage was reduced to 16 GB in return, but a version with 32 GB will be launched soon. Both the volume rocker and the power button have been completely reworked and leave a higher quality impression. At the top is a dark plastic cover for the infrared sensor that can be used to control your multimedia devices at home. The USB port at the bottom can be used to charge the battery, transfer data and thanks to the MHL support, attach external displays. 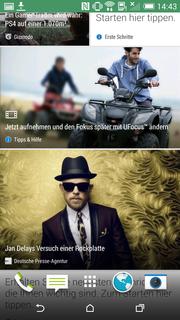 Blinkfeed: The news app has several new functions. The Zoe app is not finished. As expected for a high-end smartphone, you get the latest version of the operating system: Android 4.4 KitKat. 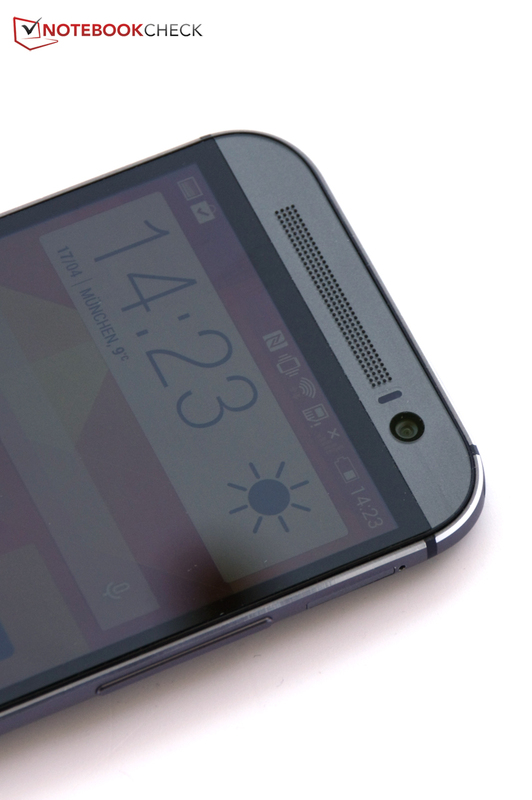 HTC uses its Sense 6 user interface, which is simpler than the predecessor. It is now also easier to update it because HTC shifted some important features to the apps Blinkfeed and Zoe. 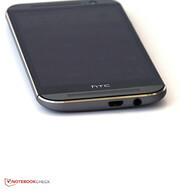 Color markings in apps and menus from HTC are also supposed to help the user navigate through the system. All messaging services, for example, have the same color scheme. In addition, you can define your own color schemes similar to Windows Phone, which changes the background image and the contrast color in the menus. Blinkfeed was improved as well and got some new features. The app for social media content, news and tutorials for the phone now learns better and also gives information based on your location, for instance, restaurants nearby that could please the user. A new feature is the gesture control, which can be used to unlock the smartphone with a swipe of a finger or launch the camera app if you hold the HTC One M8 at eye level. 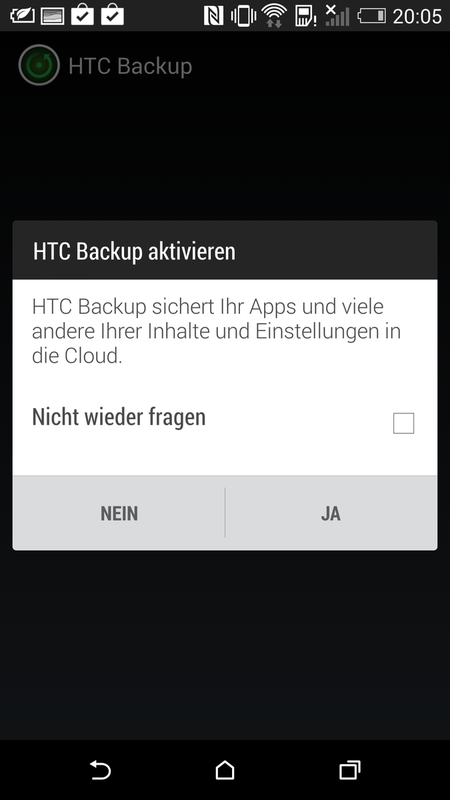 Annoying: We repeatedly got a window after the installation of an app with the question, if we wanted to save the data via HTC Backup. Even if we selected that we did not want to see the message again, it still popped up every time. 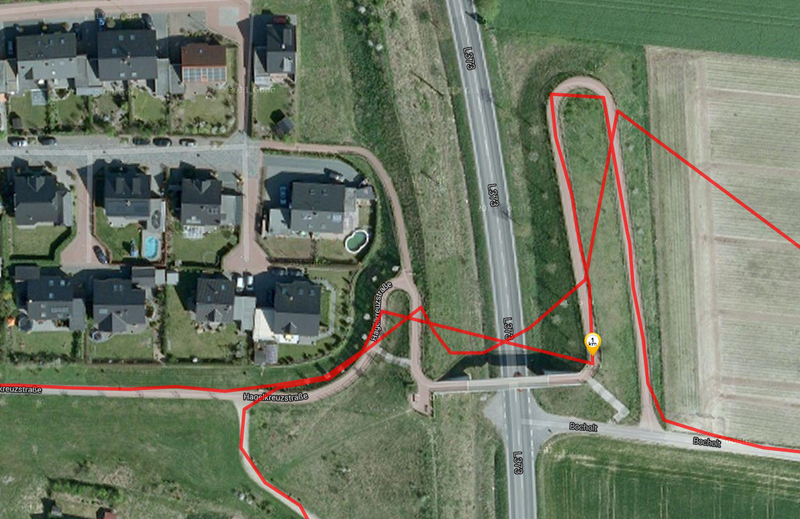 The GPS is accurate down to ten meters indoors. 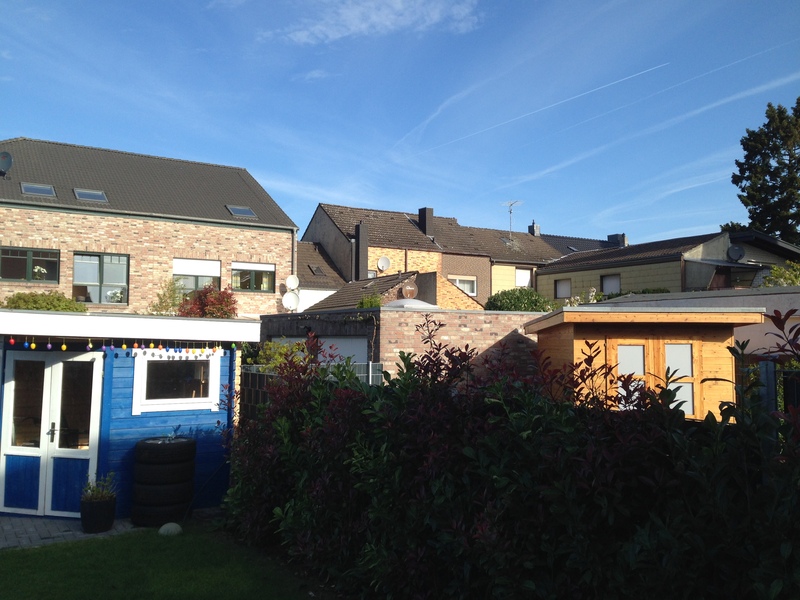 Outdoors down to five meters and less. You rightly expect support for all current communication standards when you spend more than 600 Euros (~$832) for a smartphone. The HTC One M8 does not disappoint. All WLAN standards, including the super fast 802.11 ac, Bluetooth 4.0, NFC as well as quad-band for GSM, UMTS with HSPA+ and LTE are available. The signal quality was also decent; the LTE speeds were usually close to the maximum transfer speed of our SIM card (50 Mbps) in the metropolitan area. 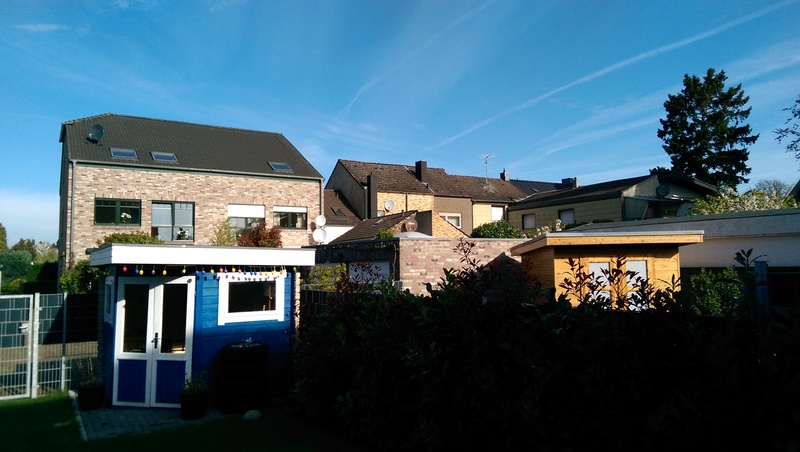 It is the similar situation with the WLAN module: We still had a strong signal with a distance of 10 meters (~33 feet) from the router and through three walls; it only dropped to three out of four bars occasionally. Another wall and three more meters (total ~43 feet) resulted in three of four bars. The GPS module also supports the Russian Glonass system and manages an accuracy down to ten meters indoors. The accuracy is increased down to five meters (~16 feet) outdoors, and it is even better in the open country. 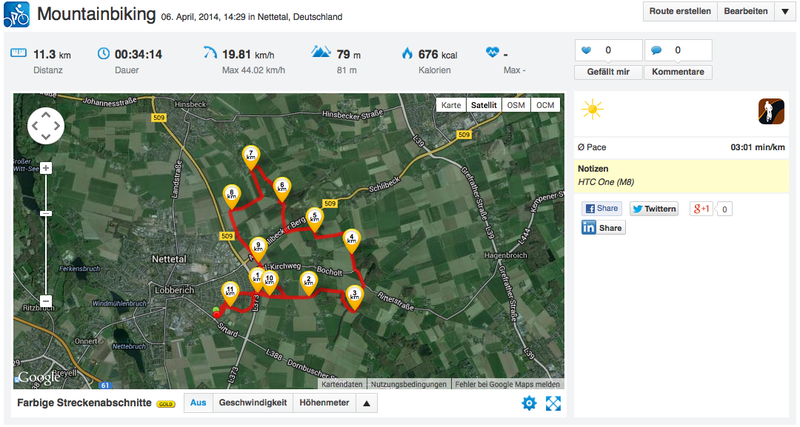 We took the HTC One M8 on a bicycle ride and compared it with the professional navigation device Garmin Edge 500. 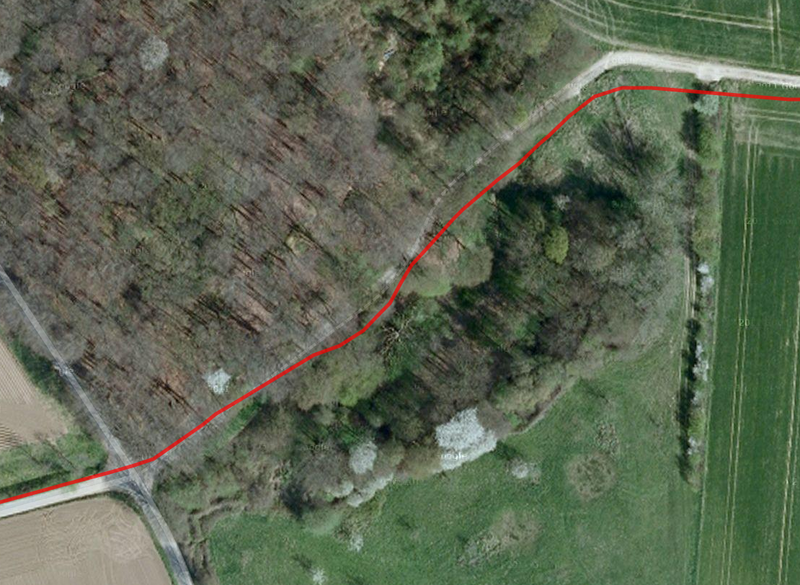 The HTC One M8 does not really have any problems in the forest section, but the GPS sensor got a bit confused at the bridge. 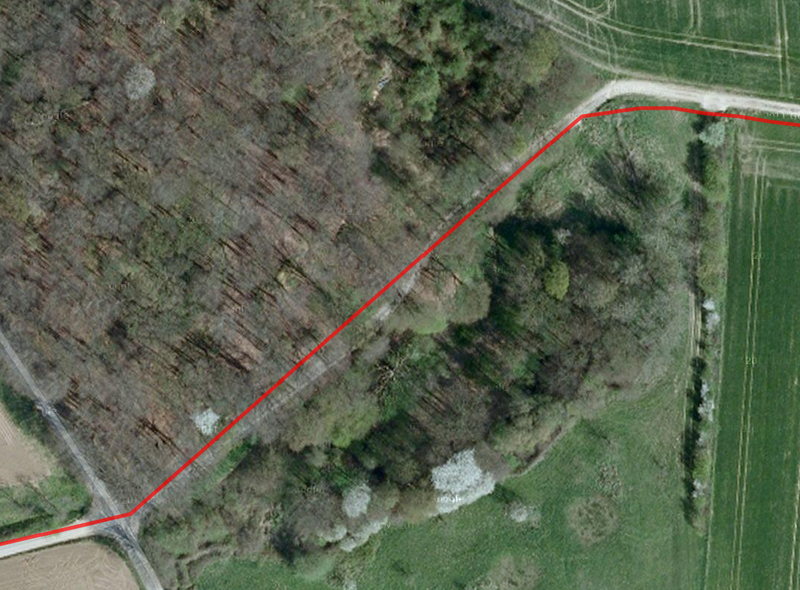 The overall track length of the smartphone was around 400 meters (~0.25 miles) shorter compared to the navigation device. HTC reworked the phone app as well. The numeric buttons are now slightly smaller, but still easy to hit. We really like the possibility to type in a name and directly access the corresponding contact. Groups and favorites can also be created and there is a voice control via Google Now. The excellent speaker at the top of the front is also used as the earpiece during calls, so the voice quality is accordingly very good: The other person is very clear, easy to understand and easy to hear in loud environments. The same applies for the other end of the line. Using the integrated hands-free feature is a joy to use as well because the excellent speakers produce very clear voices. ... and refocussed with UFocus. 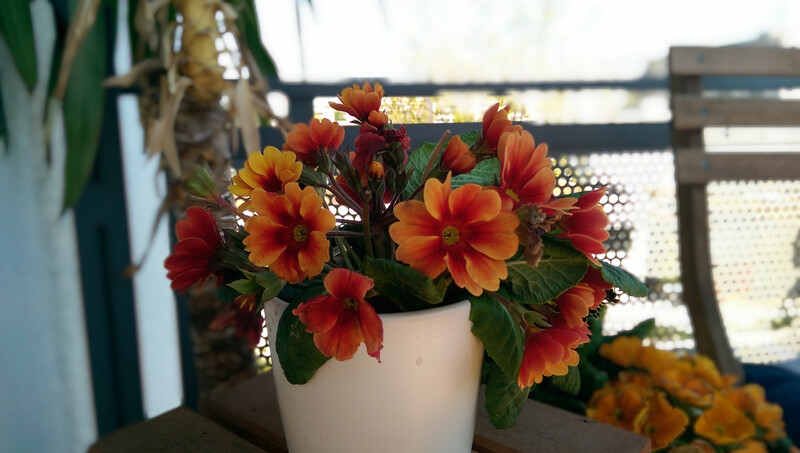 Compared to the Galaxy S5 we like the nice blur effect and the sharper foreground. 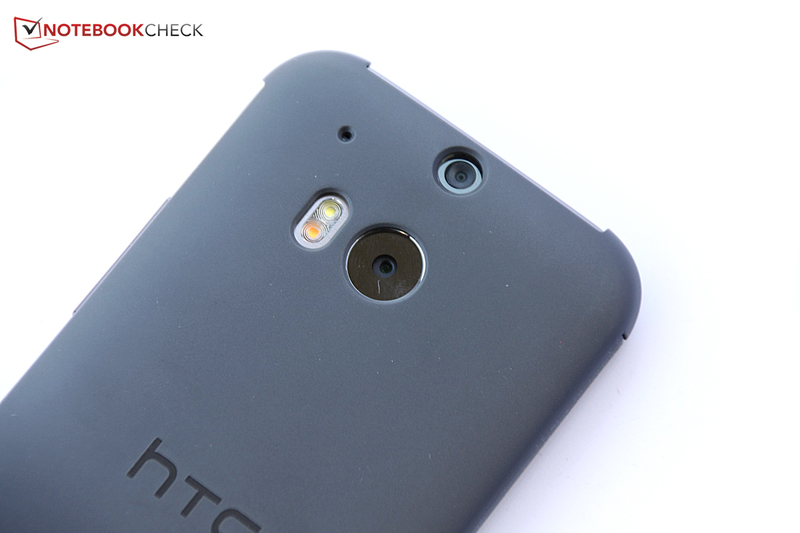 We already mentioned that HTC designed something special for the camera at the back. But one thing at a time: At a first look, the camera on the back does not seem very up to date with a resolution of just 4 MP. The predecessor, the One M7, also had a 4 MP camera at the back, and it is actually the same sensor – the One M8 even lost the image stabilization. This seems to be a step in the wrong direction. 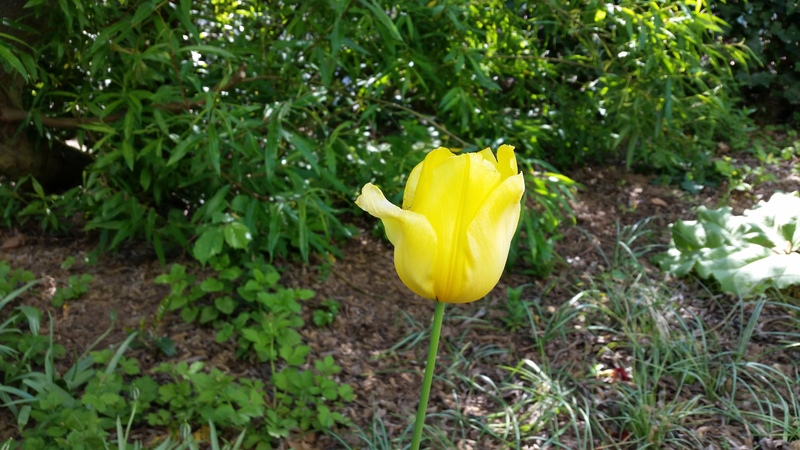 Nokia set the bar very high with the 40 MP camera of the Lumia 1020, admittedly with a very bulky case in return. The upcoming Nokia Lumia 930 uses a 20 megapixels camera and devices from last year, for example the Google Nexus 5 or the iPhone 5S have at least 8 MP sensors. 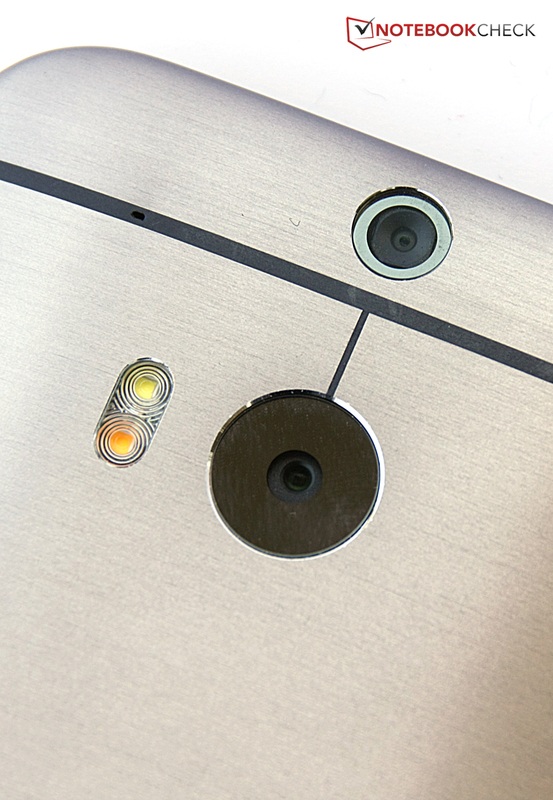 HTC says that larger pixels can capture more light and therefore improve the picture quality. 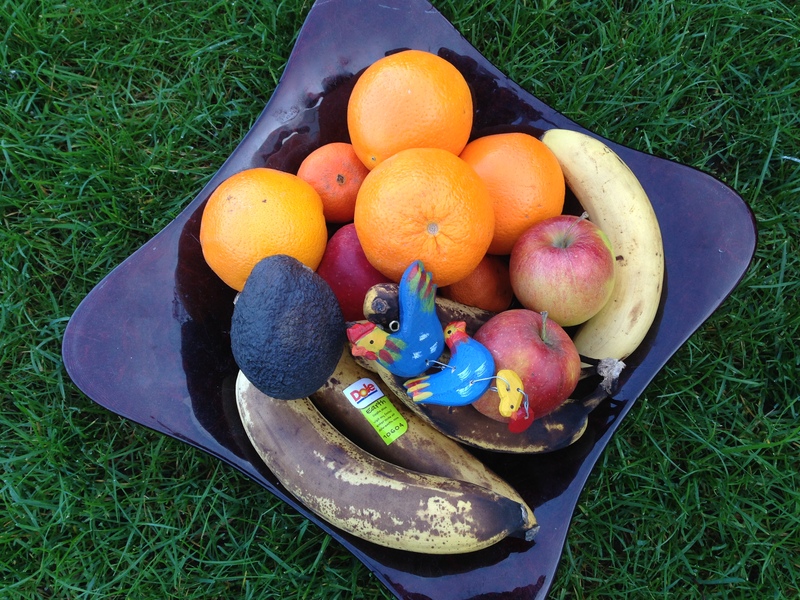 This might be correct, but when you look at the details of the pictures, you can see that the Apple iPhone 5 with an 8 MP camera, for instance, creates much sharper detail, for example the sticker of the bananas of the fruit picture: The text is easier to read compared to the picture of the HTC One M8. Brighter areas are also not as sharp compared to other cameras. All in all the picture quality is okay, but more pixels would not have hurt the quality. At least you get, similar to the predecessor, good pictures in low-light situations. HTC integrates a second lens at the back, which not only improve the focus, but also enables cool effects. This second lens captures, calculates and stores depth information of the picture, which means you can shift the focus very precisely after you take the picture. You can also select faces in pictures and shift layers to create the popular parallax effect. This could be a reason for the low-resolution sensor: The processing required for these effects may have been too consuming for a smartphone with a higher megapixel camera. All these effects are nice, but the results really depend on the picture: The selection of people only works reliably on a plain background and 3D movements around objects are also imprecise for smaller objects. 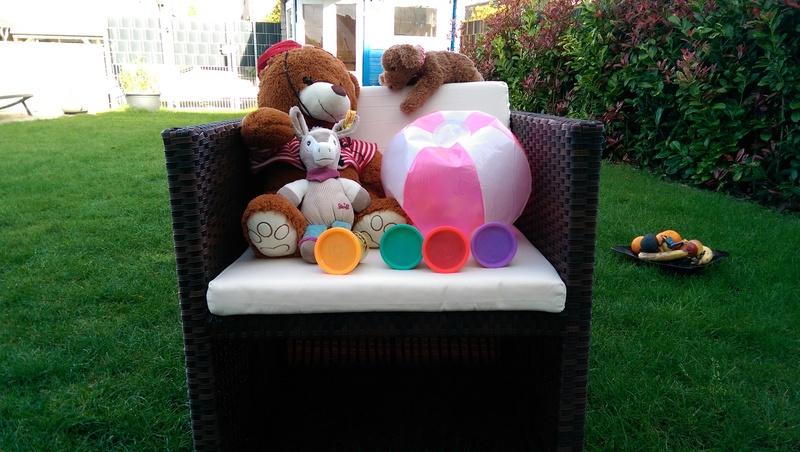 UFocus, the dynamic shifting of the sharpness, only works with good pictures that have a lot of depth to start with and where objects are clearly set apart from each other. If you look at the plant in front of the small balcony fence, you can see that the blurring effect only works on a part of the fence. 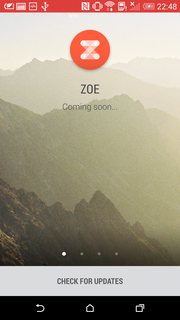 It is unfortunate that the new version of the Zoe app is not ready for the launch. Users will have to wait until summer of 2014 before they can create albums with automatic effects. It is interesting that the front camera actually has a higher resolution of 5 megapixels, which is most likely due to the selfie trend. The picture quality with normal lighting conditions is similar to the camera at the back, but significantly worse in dark environments. 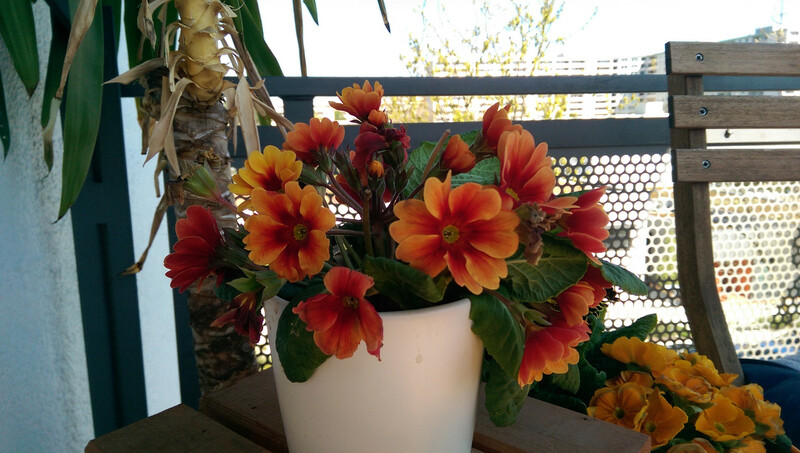 The overall camera features of the HTC One M8 are okay if you just want to make a quick picture for Facebook or Instagram and use some cool effects. The Duo camera at the back saves a lot of time and the inaccuracies are not really a problem. 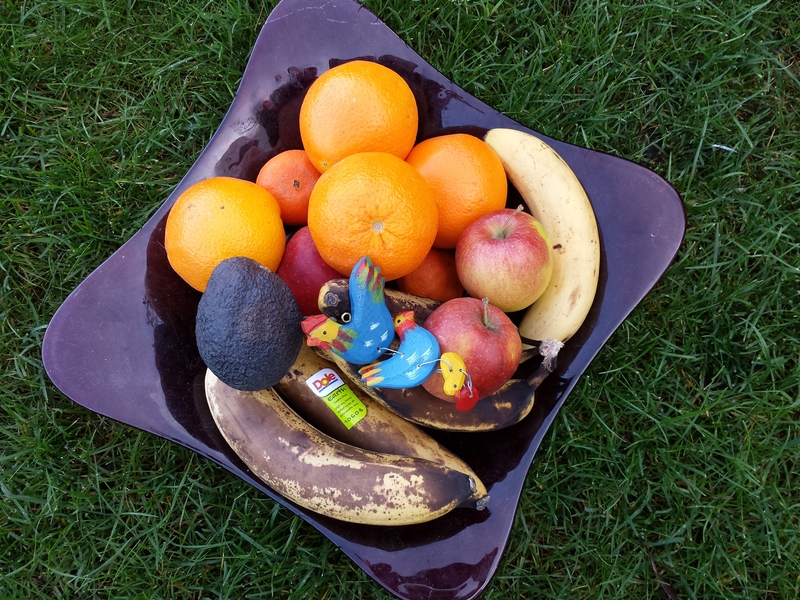 However, we cannot recommend the HTC One M8 if you expect sharp and high-resolution pictures from a smartphone. 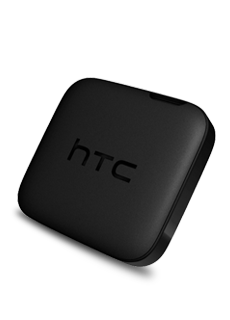 HTC ships the HTC One M8 with several accessories: A wired headset, a tool to remove the SIM card, a micro USB cable, a power adaptor, a quick start guide and a silicone cover. If that is not sufficient, you can get several optional accessories as well. We like the DotView cover in particular. 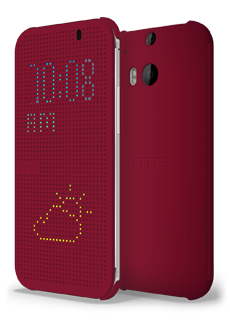 First of all, if you like it more colorful, you can equip the HTC One M8 with a blue, green, red or orange cover. It also has dozens of small holes at the front. But why is that so great? 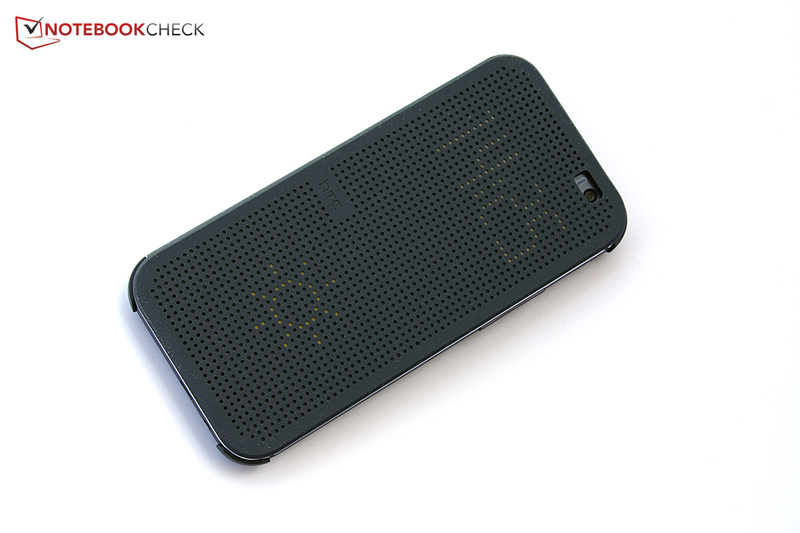 The smartphone can show basic information in a large font size thanks to these holes, and you can even control the device to a certain extent without opening the cover. 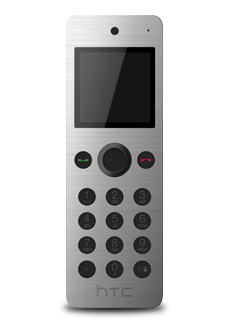 Incoming calls, for instance, are displayed by number or name and can be accepted with a swipe over the front. However, the covers are not cheap at 39.90 Euros (~$55). 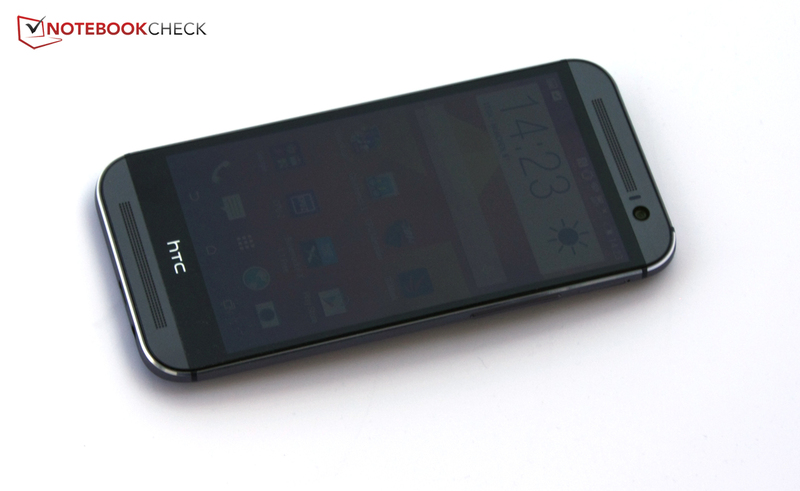 HTC Fetch is coupled with the smartphone and triggers the ringtone if you misplaced your smartphone. It also gives a warning if you forgot your smartphone and can transmit the last known position when you lost the smartphone or the Fetch. 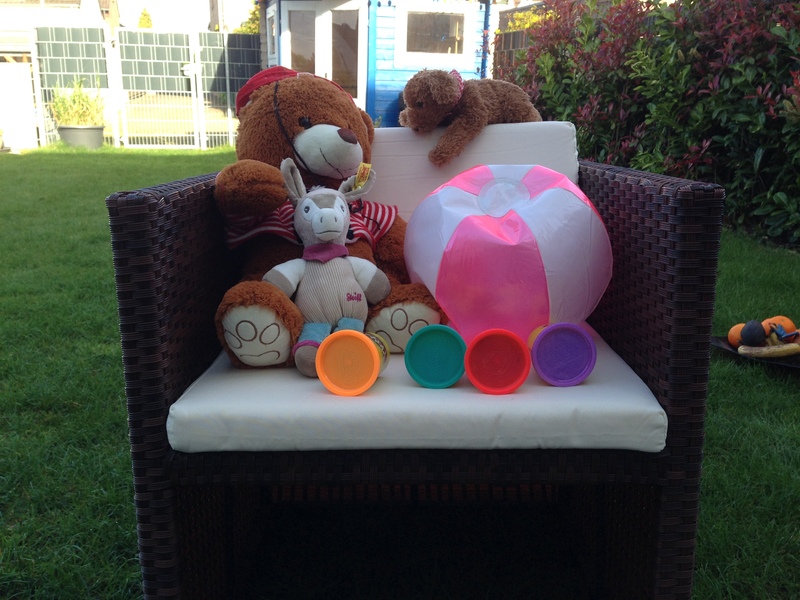 The small helper is available for 15 Euros (~$21). HTC Mini+ is a remote control that lets you accept calls while you can continue web browsing on your smartphone. Furthermore, you can receive text messages and much more. However, the little device is rather expensive at 113.99 Euros (~$158). Finally, there is a portable speaker with an integrated smartphone stand, a wireless speaker and HTC Media Link HD, which allows you to send data from your smartphone to your TV, similar to Google’s Chromecast. 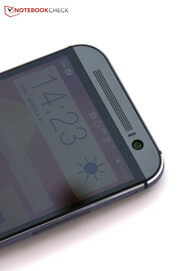 The warranty period is 24 months, but HTC does not offer an extension. We really liked the very precise control right away: The capacitive touchscreen is very precise, even in the peripheral areas, and reacts very quickly. The smartphone can handle up to ten inputs simultaneously. 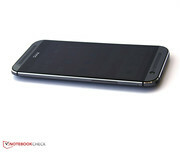 It is also convenient that both the touchscreen and the back of the smartphone hardly attract any fingerprints. Motion Launch allows you to unlock the device with a swipe across the screen, depending on the direction you get to the menu or to your widgets. 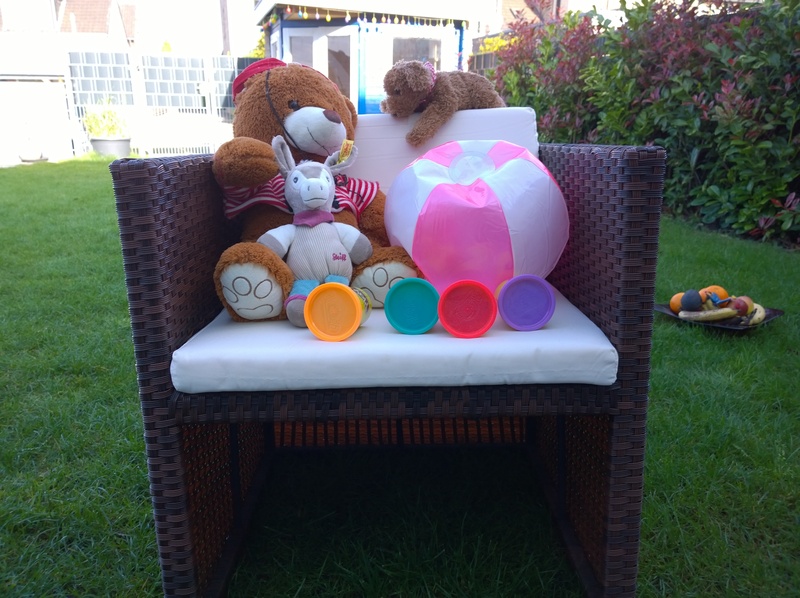 Push the volume rocker in landscape mode and you activate the camera. This obviously only works if you are not using an unlock code. Contrary to the predecessor, you just get software buttons this time, so you do not benefit from the slightly larger screen in many applications – the three buttons at the bottom have to be displayed as well. 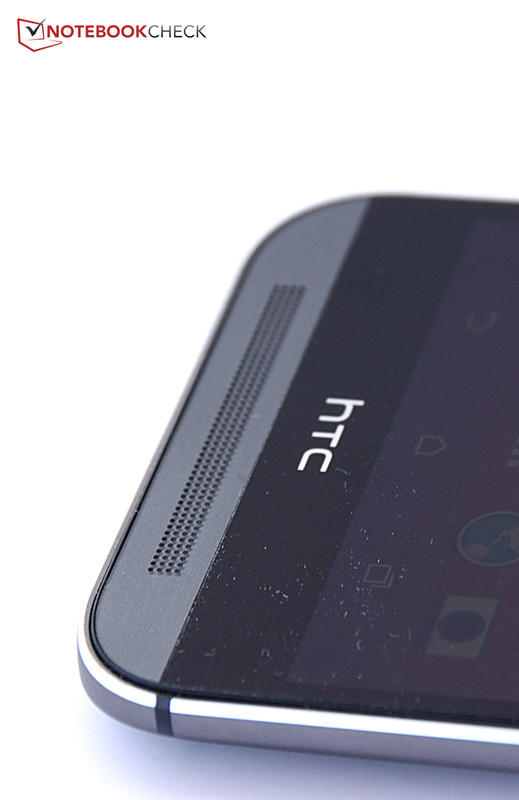 The HTC One M8 does however have three buttons in return (Back, Menu, Apps), whereas the HTC One M7 only had two. 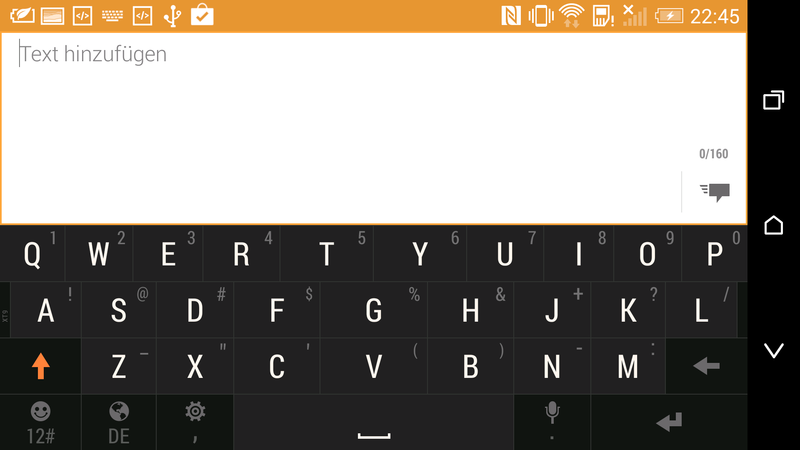 The standard Google keyboard has been replaced by an HTC version. 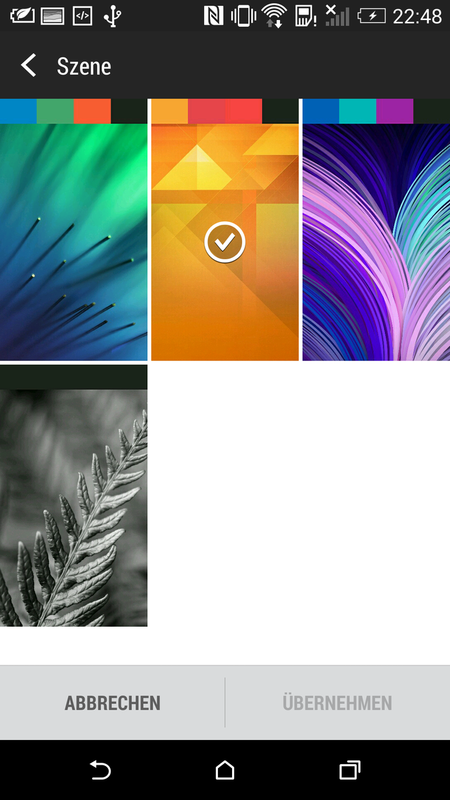 HTC Sense Input requires less space in portrait mode than the stock Android version in general, but there are no word suggestions right away. 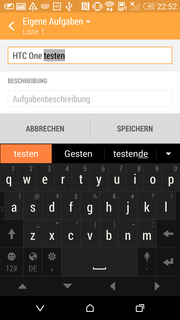 The keyboard layout can be adjusted for many languages with a button. This might be handy for many users, but it occupies space on the somewhat crowded keyboard for users who just use one language. Switching between the languages also does not work perfectly: Although we selected the German layout, the Y was in the first row, similar to the English layout. HTC Sense Input especially appears overcrowded because of the double occupation of the letter keys with symbols and numbers. The operation is also not consistent: Usually you swipe to the top if you want to select an alternative allocation. This does not work for the comma key, which also works as the options key, you just have to hold it down and release it to get to the options. Otherwise, the keyboard allows quick inputs and the keys are sufficiently sized. 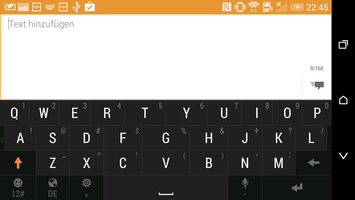 Furthermore, the keyboard supports numerous options from dictation to swipe inputs or arrow keys that can be displayed. 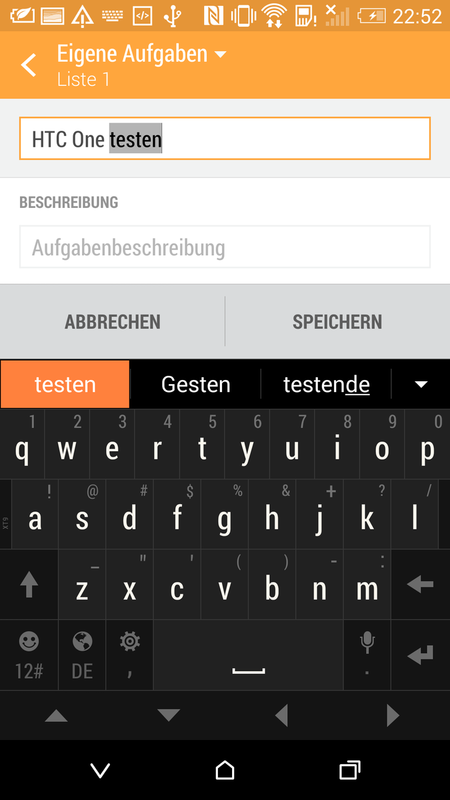 You can obviously search the Play Store if you prefer a simpler keyboard; several versions are available. 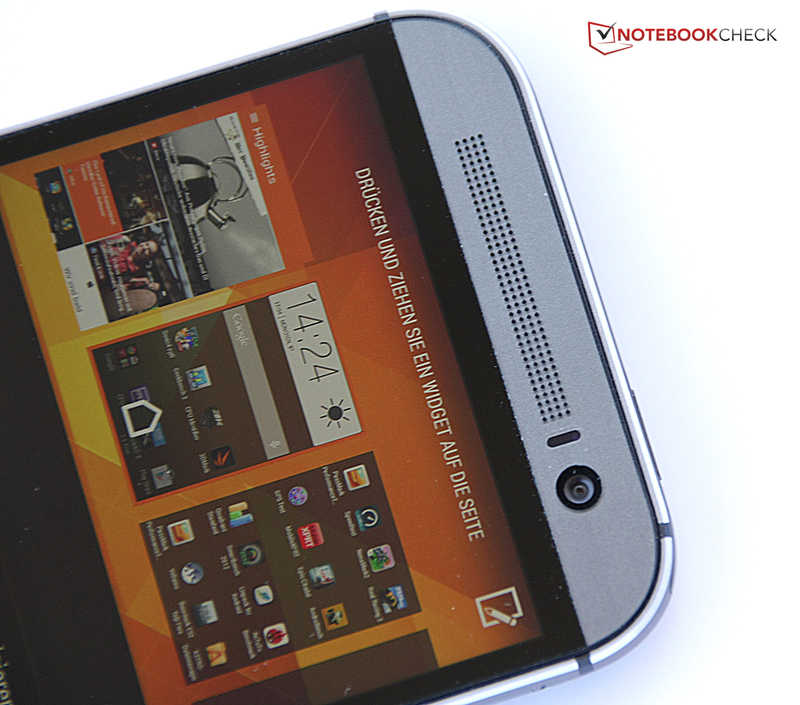 The HTC One M8 has a 5-inch display with 1920x1080 pixels, which results in a pixel density of 440 ppi. The resolution did not change compared to the predecessor, which means that the pixel density is slightly lower due to the larger screen. 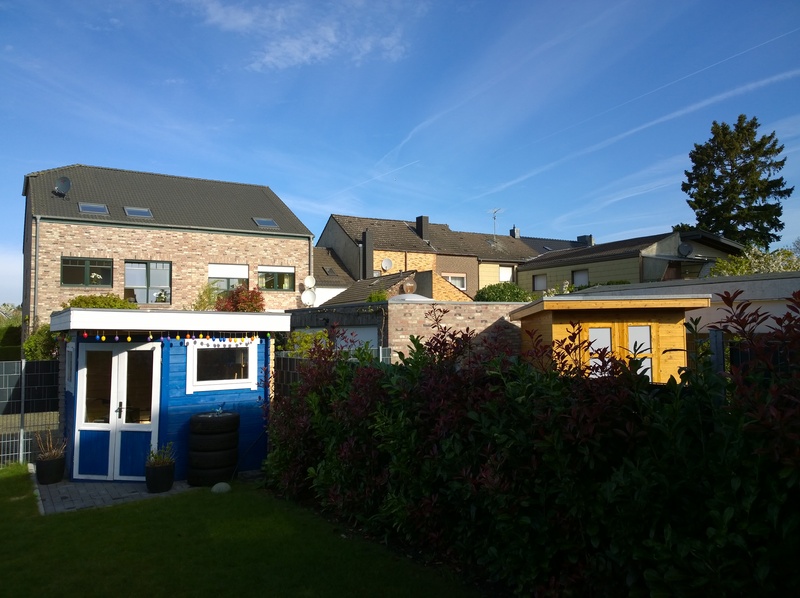 However, this is not really a problem with such a high resolution: The picture is still very sharp and you cannot see individual pixels of fonts or curvatures with the human eye. 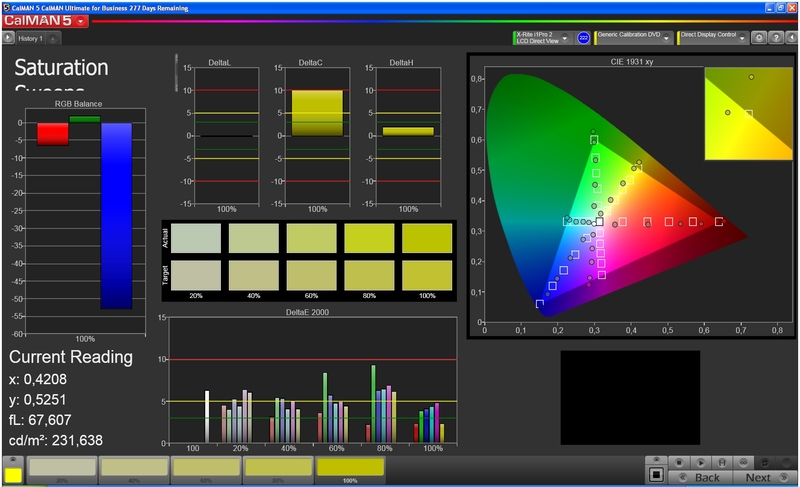 Similar to the predecessor, HTC uses an SLCD screen, which is supposed to compete with AMOLEDs in terms of luminance, color presentation and brilliance. 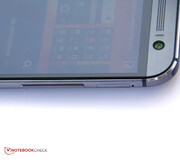 The display of the HTC One M7 could convince us with high brightness, wide viewing angles and a very low black value. 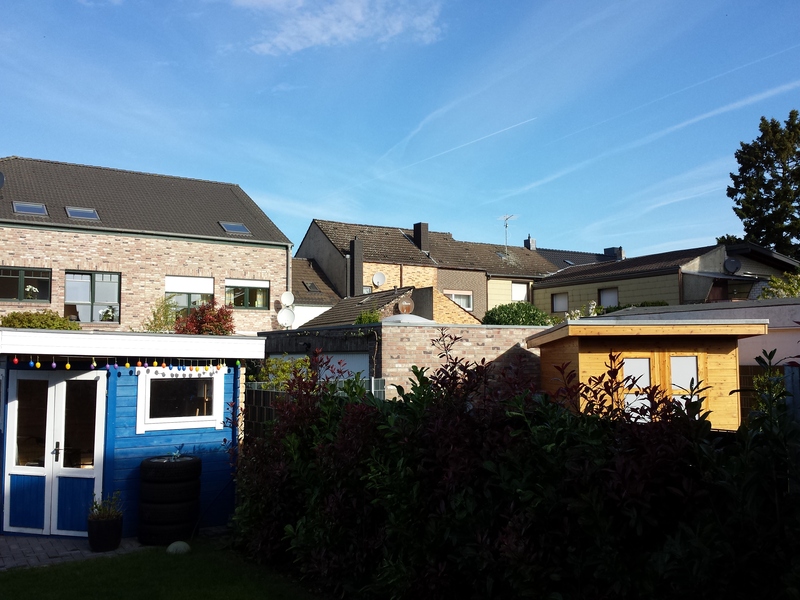 The HTC One M8 is actually similarly bright with an average luminance of 486 cd/m². 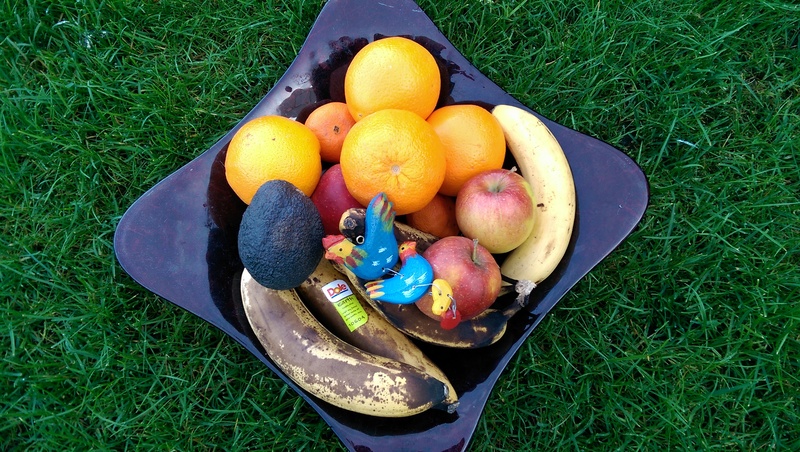 The black value on the other hand is considerably higher with 0.54 cd/m², so dark surfaces can appear slightly gray. 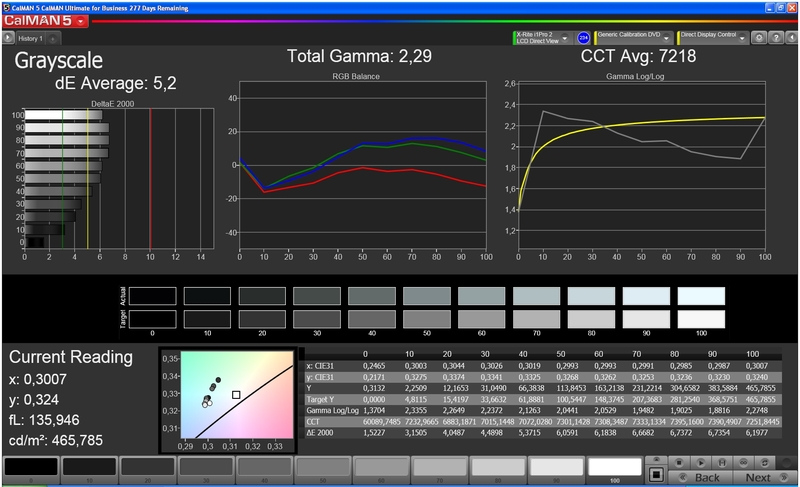 Because of the higher black value and the slightly lower brightness, the contrast is also lower at 878:1. This is still a very good result and superior to many high-end devices, but a significant deterioration compared to the predecessor nonetheless. 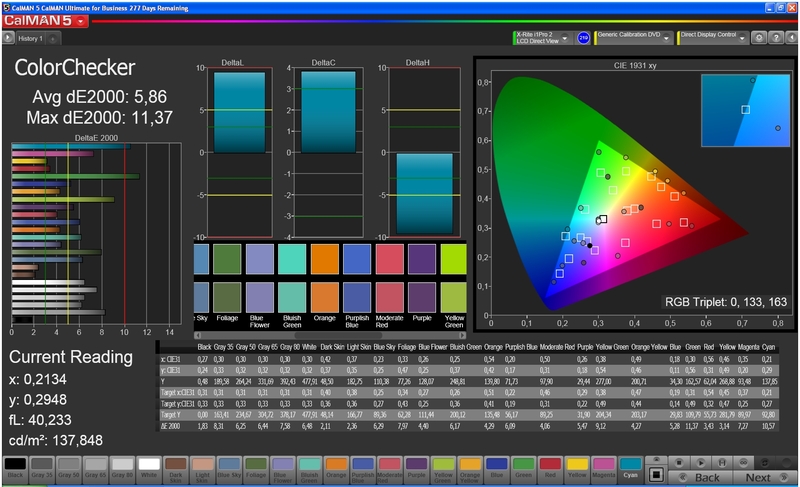 Subjectively, we like the colors and the details on the screen, but the colors of the predecessor were a bit crisper. Still, this is complaining on a high level. If you prefer vivid colors you will be better suited with an AMOLED screen of a Samsung Galaxy device since the colors of the HTC One M8 are more subdued, but also more natural in return. 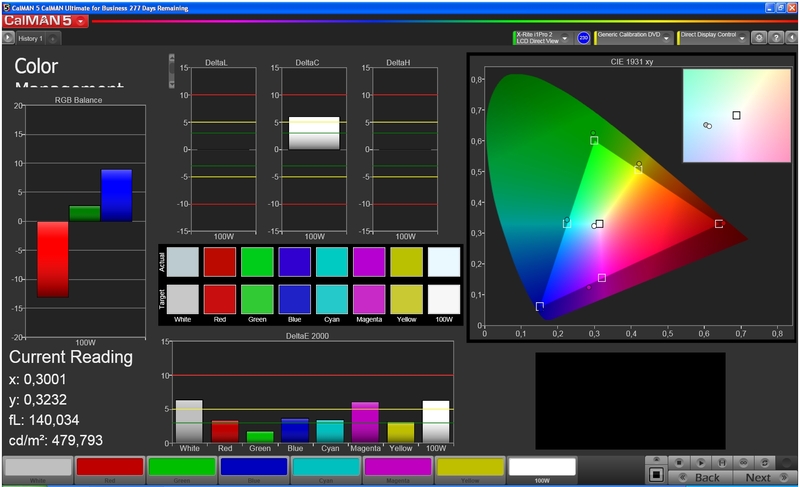 We use the software CalMAN and a colorimeter to get objective results for the picture quality. One thing that attracts our attention right away: HTC reduced the blue parts from the picture, most likely to avoid the typical blue cast of LCD panels. This works pretty well, only very bright shades of gray show a slight deviation towards blue compared to the reference value. 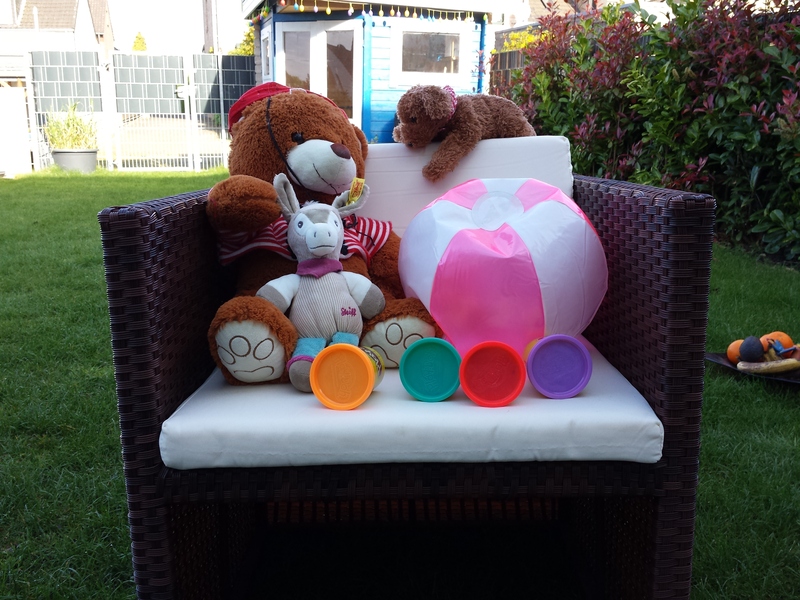 Thanks to the high brightness, you can use the HTC One M8 outdoors without problems. 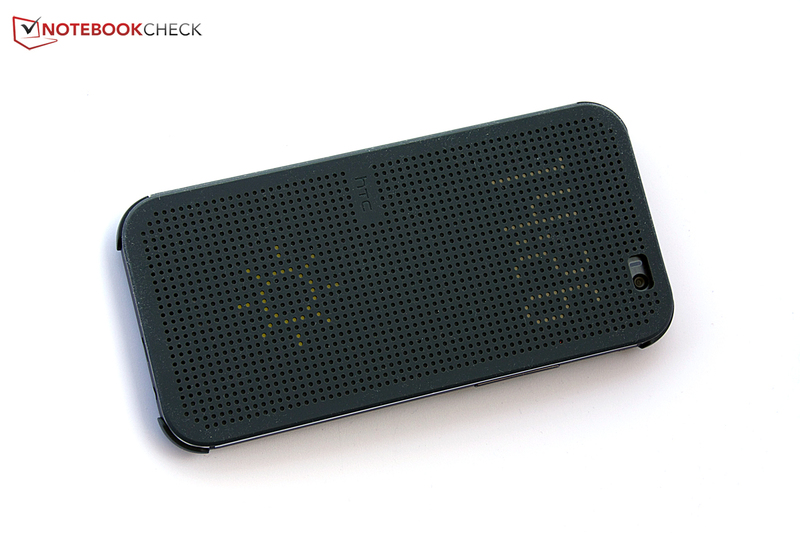 The glossy screen only limits the visibility under direct sunlight. The display of the predecessor was better in those situations because of the higher contrast. There are obviously no problems in the shade or indoors. Another positive aspect is that white surfaces do not dazzle, even with the highest brightness setting. The viewing angle stability is very good, even very wide viewing angles do not affect the readability of the display content. 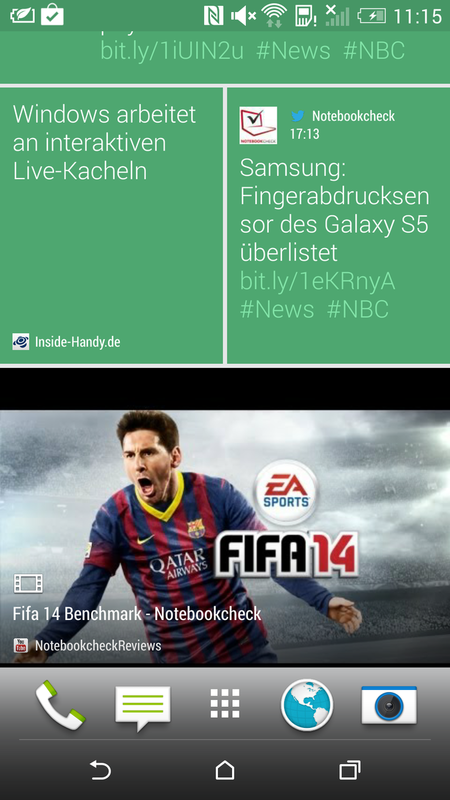 Slight brightness reductions are visible, and AMLOEDs (for example, in the new Galaxy S5) still have a small advantage. However, this should not really be a problem in practice since the brightness changes are only visible from very extreme angles. 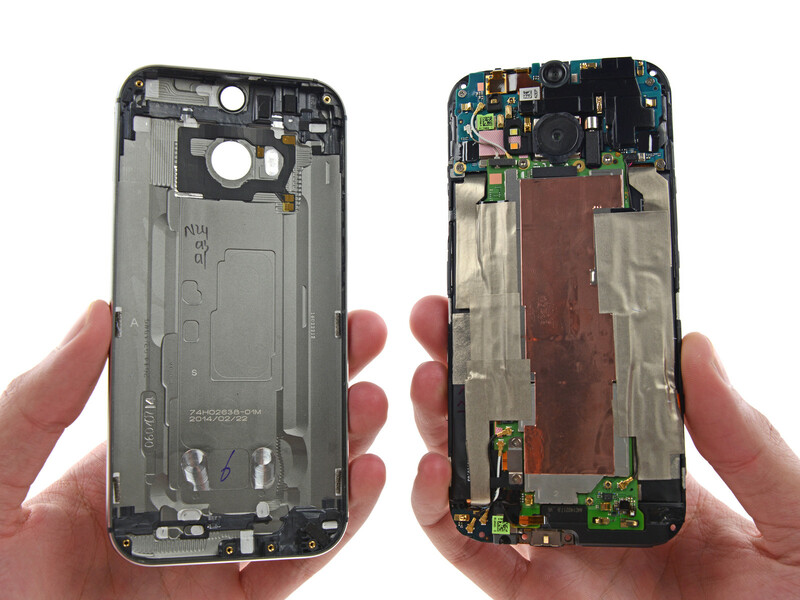 Qualcomm Snapdragon 801 MSM8974AC, this is the designation of the SoC inside the HTC One M8. As the name already suggests, the Snapdragon 801 is slightly faster than the Snapdragon 800-series. The heart of the SoC is a quad-core CPU with four Krait 400 cores and a clock of up to 2.3 GHz. The Snapdragon 801 is currently one of the most powerful mobile CPUs. This means the HTC One M8 provides a lot of performance, the Google Nexus 5, for instance, clearly falls behind (but is also much cheaper). However, none of the devices within the comparison can compete with the CPU performance of the iPhone 5S, not even the One M8. 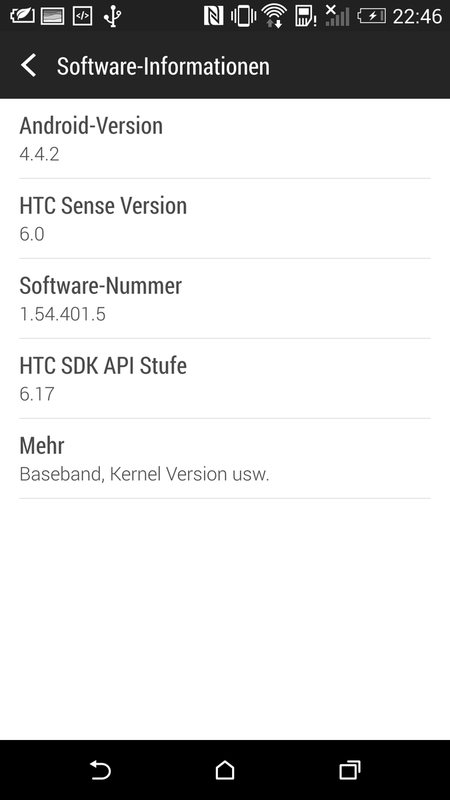 HTC optimized the firmware of the HTC One M8, so that the smartphone manages higher results in benchmarks. Futuremark, for example, already banned the One M8 from the leaderboards of 3DMark. The results are therefore less meaningful. However, the SoC of the HTC One M8 is still powerful enough to run most of the apps from the Play Store without problems, but you should be careful when you compare the One M8 with other smartphones. According to our colleagues from AnandTech, you can solve the problem when you rename the installation files of the benchmarks. 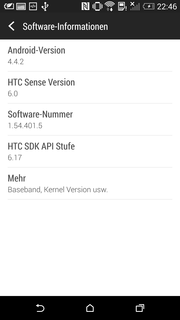 The HTC One M8 does not recognize the benchmarks anymore and does not activate the turbo. The 3DMark result actually drops from 20,535 points to 13,856 points, almost 30%! AnTuTu 4 also shows a significantly lower performance after the renaming (30,486 -> 19,844). We did not expect big performance jumps from the new SoC, but it is still surprising that the One M8 is behind the Google Nexus 5 in AnTuTu 4 without the manipulation. However, it is just one benchmark where the smartphone falls behind this clearly. The Adreno 330, which handles the graphics, is already familiar from other devices, for example the Sony Xperia Z1 or Google Nexus 5. Thanks to its clock of 575 MHz and the large memory bandwidth, it is currently one of the fastest mobile GPUs on the market. However, the 3DMark results without the manipulation hardly show a higher performance compared to the last generation of high-end smartphones. 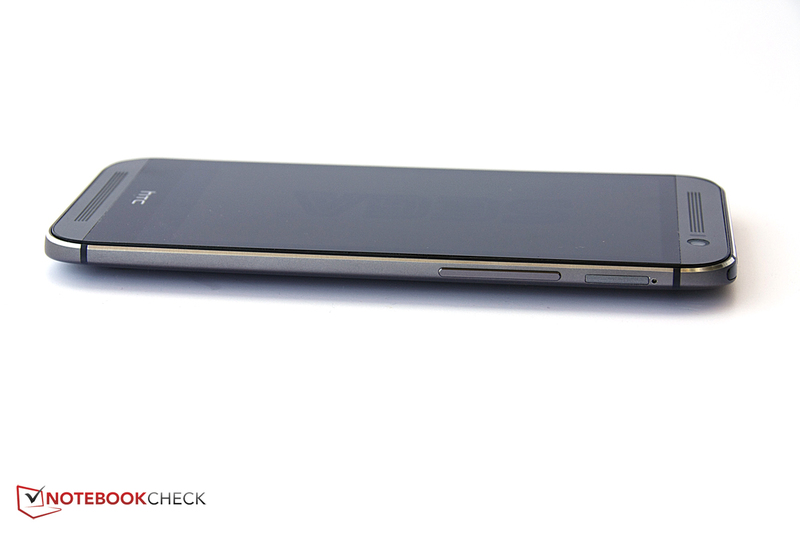 Sony's Xperia Z1 is actually ahead. 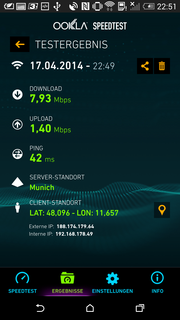 Fast web browsing is obviously another basic requirement for satisfied customers of a high-end smartphone, and the HTC One M8 does not disappoint: Both the benchmark results and the subjective performance are very good. No stuttering, fast loading of websites and the stable signal of the WLAN module and mobile Internet support this impression. 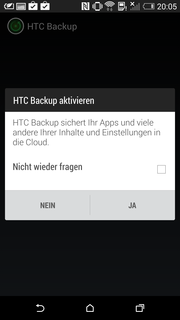 The performance of the internal storage is satisfying as well, and the HTC One M8 can even take the top spot with sequential transfers (read and write). This could also be a result of the fast SoC, which has an eMMC 5.0 interface for the storage. There is still no storage that could use the full performance of the interface, but you can at least make sure that the full performance of the module is utilized. 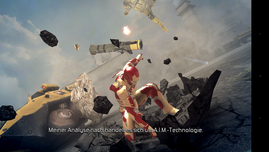 The HTC One M8 certainly has sufficient performance for games: It does not matter if you play casual games with 2D graphics like Angry Birds: Star Wars 2, the 3D game Iron Man 3 or a soccer match in FIFA 14. All games that we tested on the One M8 convinced us with short loading times and completely smooth gameplay. The good impression is also supported by the very precise touchscreen and the very exact position sensor. 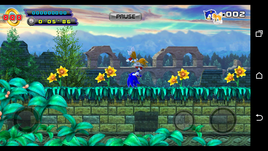 Gaming on a smartphone really benefits from accurate input devices. 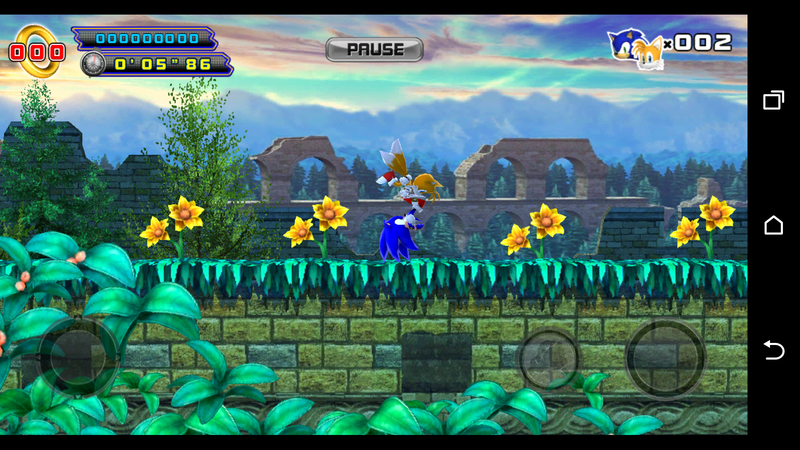 ... Sonic and pretty much every other current game is no problem for the HTC One M8. Because of the metal case, you can feel more of the heat from the HTC One M8 compared to smartphones with plastic cases like the Samsung Galaxy S4. However, there is not much to feel in the first place. We can measure a maximum temperature of 39.2 °C (102.6 °F) at the front of the One M8 in the area of the camera. This is perceptible, but the smartphone still feels comfortable in the hand under maximum load. You can hardly notice the warming of the case during idle: Up to 33.9 °C (93.0 °F), once again around the front camera and up to 30 °C (86 °F) at the back. ...at the top and bottom of the front. 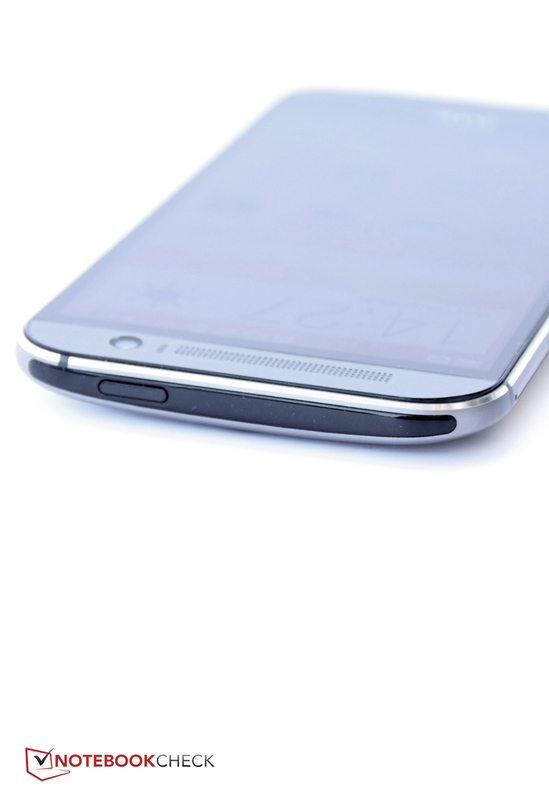 The HTC One M7 already had excellent speakers: Located at the front and supported by Beats Audio, we called them “the currently best smartphone speakers”. The One M8 obviously had to improve that, but without the cooperation of Beats. The new BoomSound system also consists of two speakers at the front with an impressive maximum volume of 95 dB(A) according to HTC. It is actually loud enough to listen to music in the next room, a very impressive performance for a smartphone. The sound quality itself is very good: High and medium tones are well defined and we cannot hear any distortions, even at high volumes. Thanks to the two speakers at the opposite sides of the case you can also hear a slight stereo effect. Bass is present, but obviously limited due to the size of the case. 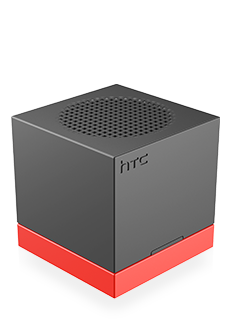 HTC managed to reserve comparatively large spaces for the two speakers: 0.85 cm³ (~0.052 cu in) at the top and 0.80 cm³ (~0.049 cu in) at the bottom. The Taiwanese also included a software control that protects the speakers against critical volumes and possible damage. The equalizer settings are no longer available in the menu, you can only deactivate the BoomSound, and this only works if headphones or external speakers are attached. The HTC One M8 is not an especially frugal device: An average idle consumption of 1.4 Watts is clearly higher than the iPhone 5S or Google Nexus 5. The same applies for the maximum consumption of 5.7 Watts, which is much higher than many rivals. The standby consumption is okay with 0.2 Watts, and the smartphone does not consume any power when you turn it off. 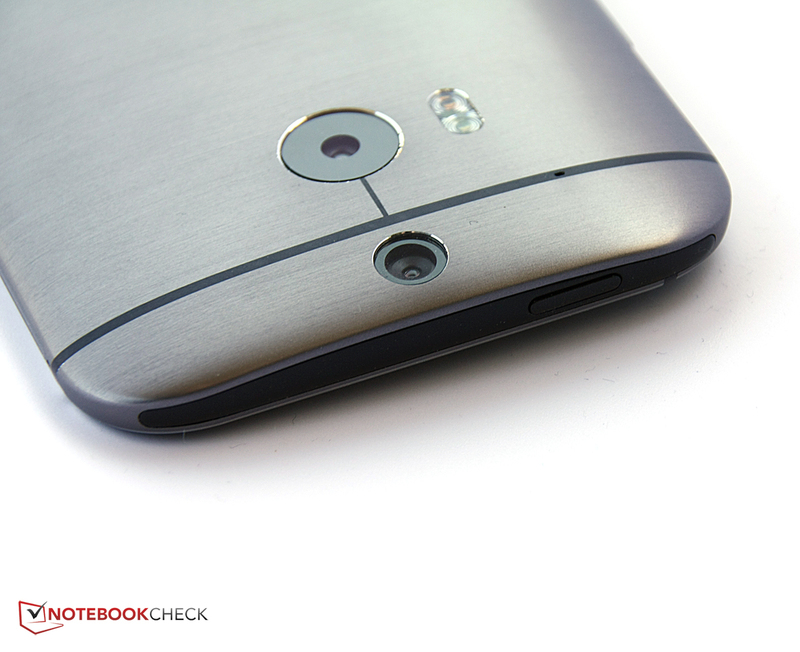 HTC equipped the One M8 with a powerful battery with almost 10 Wh. 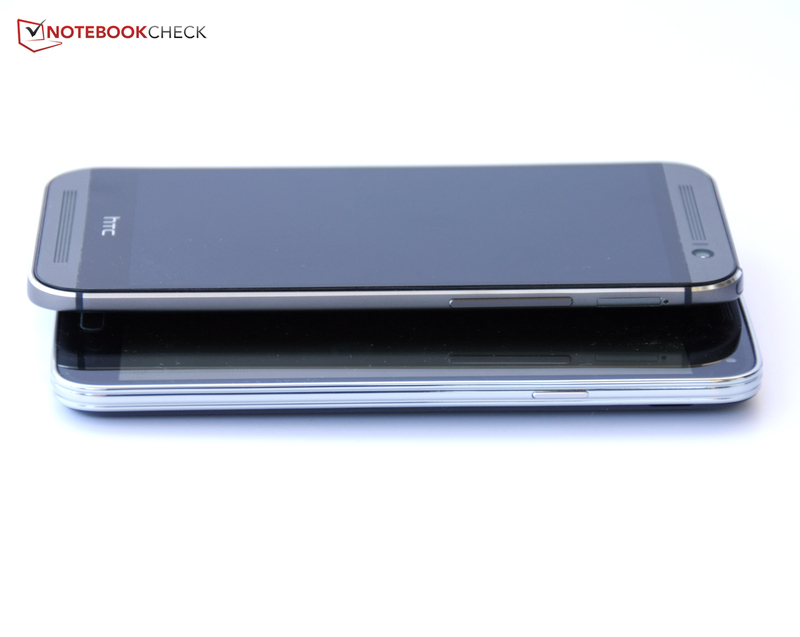 This is an increase of around 12% compared to the HTC One M7. However, due to the mentioned higher power consumption, the battery runtimes are not overwhelming: We determined 7:33 hours in our realistic WLAN test. This result is comparable to the LG Optimus G Pro. Many other high-end smartphones manage 10 hours and more. Overall, the battery runtimes are lower than the HTC One M7, but still competitive. 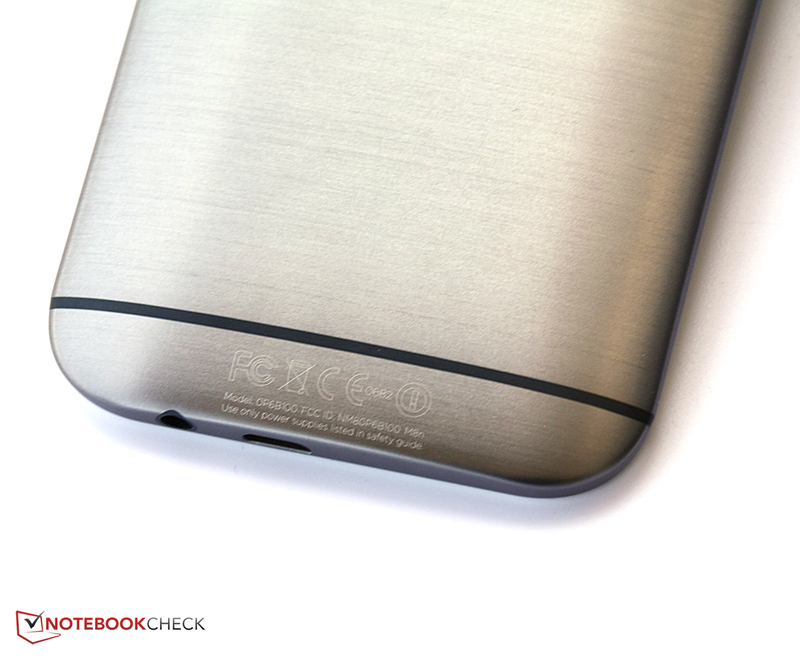 Our colleagues of AnandTech also determined the battery runtimes of the HTC One M8 with several benchmarks. Their results showed a higher runtime of the One M8 compared to the predecessor with a runtime of around 9 hours in their web-browsing test. HTC equipped the One M8 with an additional feature: The Extreme Power Saving Mode, which is similar to the energy-saving mode of Windows Phone 8. 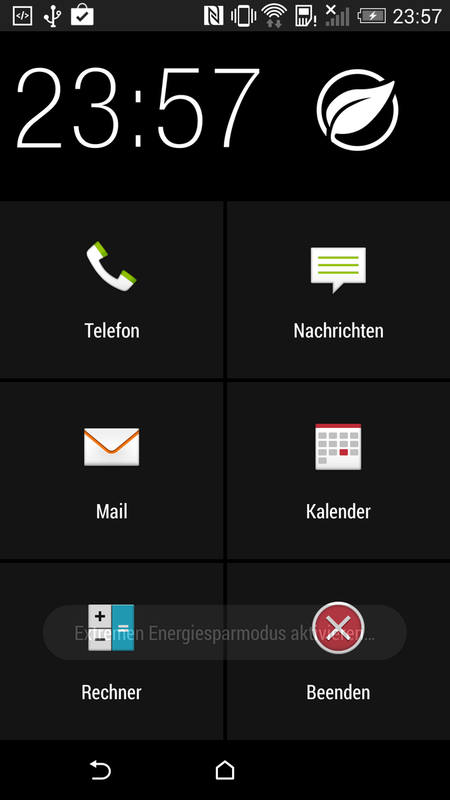 However, HTC’s version is even more radical: You can access some features with a special menu and only refresh your mails manually. We managed a runtime of around 5 hours with 10% battery and occasional use. This results in a bonus for the battery rating. 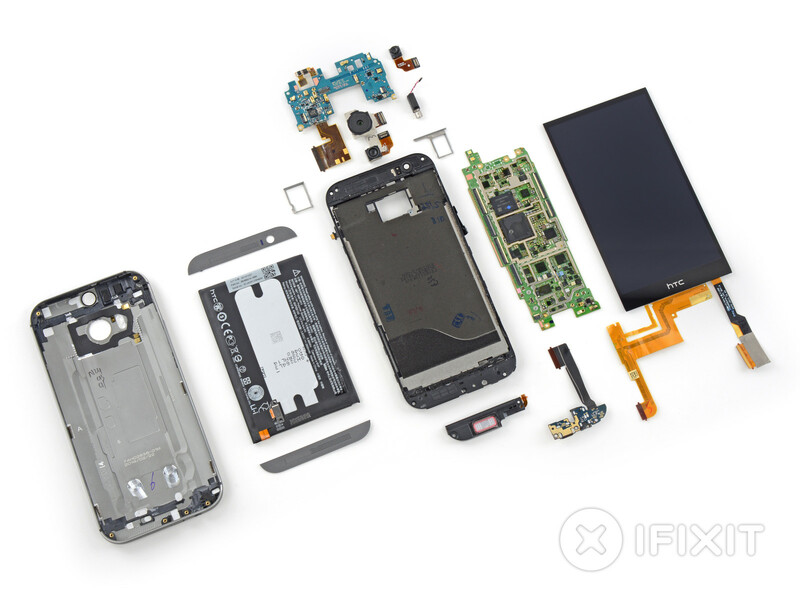 Fans of the old HTC One M7 will be very satisfied with the new generation: Finally expandable storage, finally a unibody case, finally a higher-resolution camera – although at the front. The camera at the back still just uses a 4 MP sensor. We can understand that the manufacturer does not want to follow the MP race, but the pictures would definitely benefit from some more pixels. 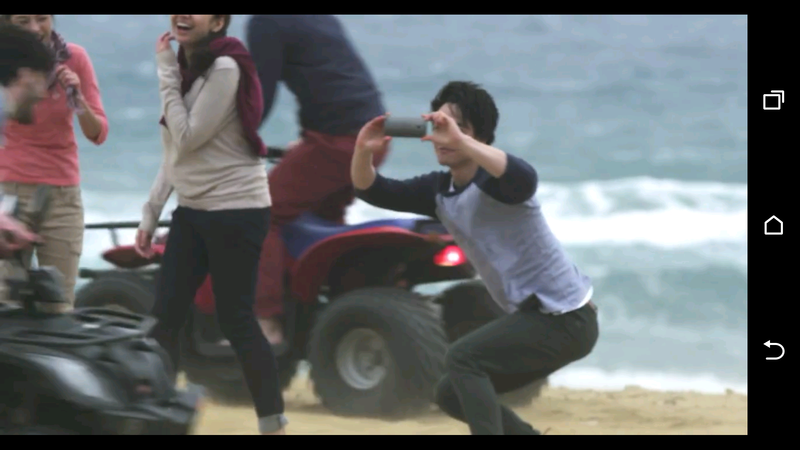 HTC includes a second camera at the back in return that helps with quick focusing and enables cool effects. Picture enthusiasts, however, will not be satisfied. The speakers are now even better than before: Very loud, very well defined and clear. They also improve the voice quality: Both persons on the call can easily understand each other. The display is similar to the predecessor, but the battery runtimes are shorter, at least if you do not use HTC’s Extreme Power Saving Mode, which is a very useful feature. All necessary communication modules are integrated and work very well. 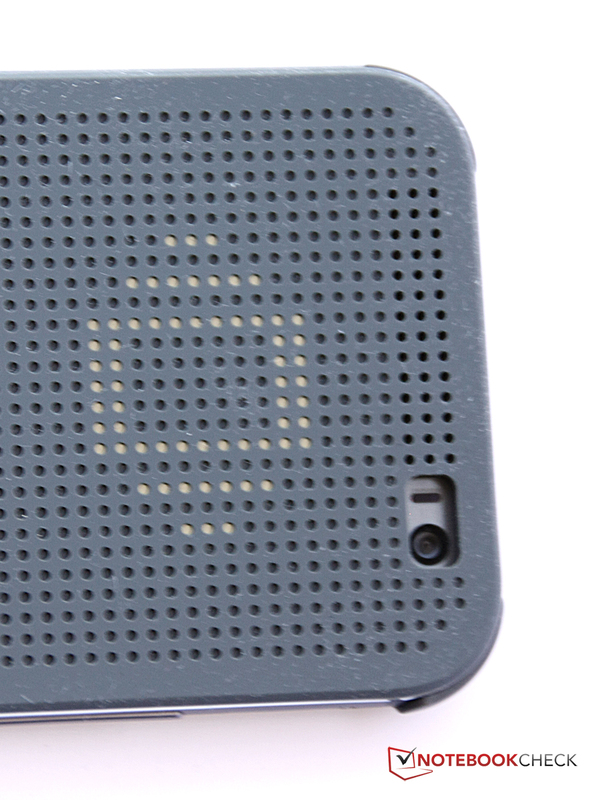 The touchscreen is very precise and cool accessories like the DotView cover expand the features. 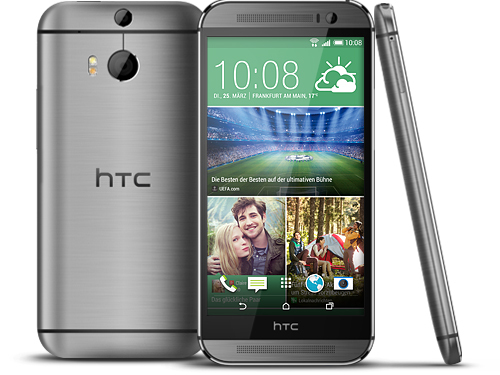 The HTC One M8 is a very good smartphone with a lot of performance and an appealing design. However, you should look for another device if you want a very good camera. If a jukebox is more important for you, then the M8, once again, offers the currently best smartphone speakers. We also add one percent point for the great accessories that expand the features and the good software equipment, but deduct one point for the manipulation of benchmark results and the missing Zoe app. We are eager to see how the HTC One M8 holds up against the Samsung Galaxy S5 and the Sony Xperia Z2 that we are going to review in the next couple of days and weeks. 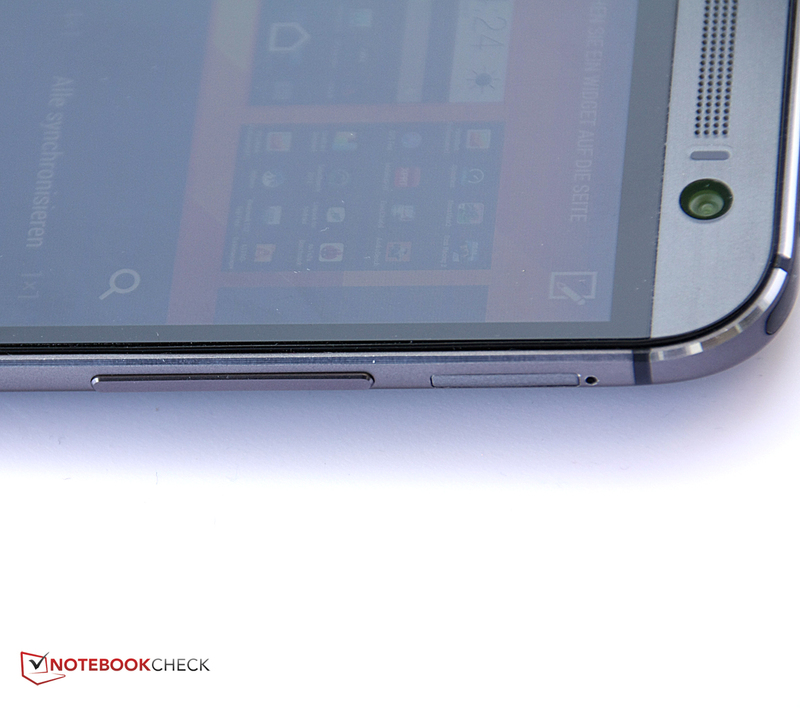 In Review: HTC One M8. Review unit courtesy of HTC Germany. 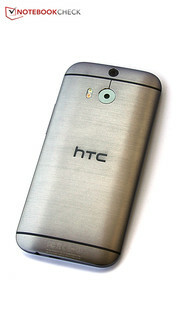 HTC consistently developed its One. You still get great speakers. There are two of them at the front. The case is also great: Unibody, metal and ergonomic shape. Neither the front nor the back are susceptible to fingerprints. However, the case is not as thin as other high-end smartphones due to the curved case. The camera at the front has a high resolution of 5 MP. This is even superior to the main camera with 4 MP. Wait a minute, isn't there a second lens? 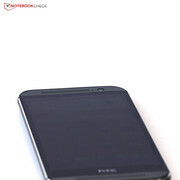 Correct, HTC integrates two cameras at the back, the second sensor helps to focus and captures depth information. 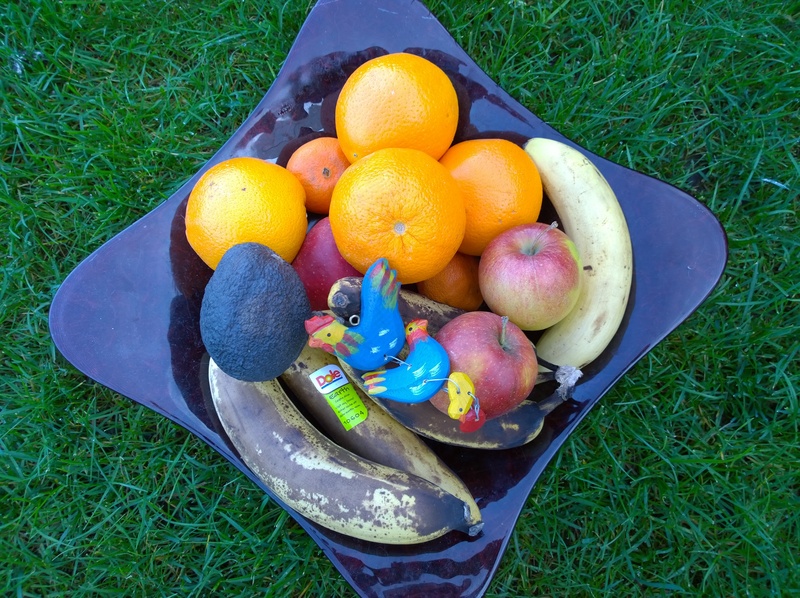 You can create numerous funny effects with the pictures, but the M8 is not the right choice for serious photographers. The front camera creates cool selfies. 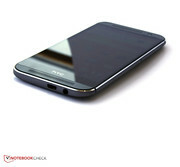 The design of the smartphone is very appealing. Almost too good for a cover. 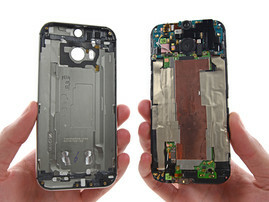 You can even operate the smartphone through the cover, at least to a certain extent. The display creates a nice picture. 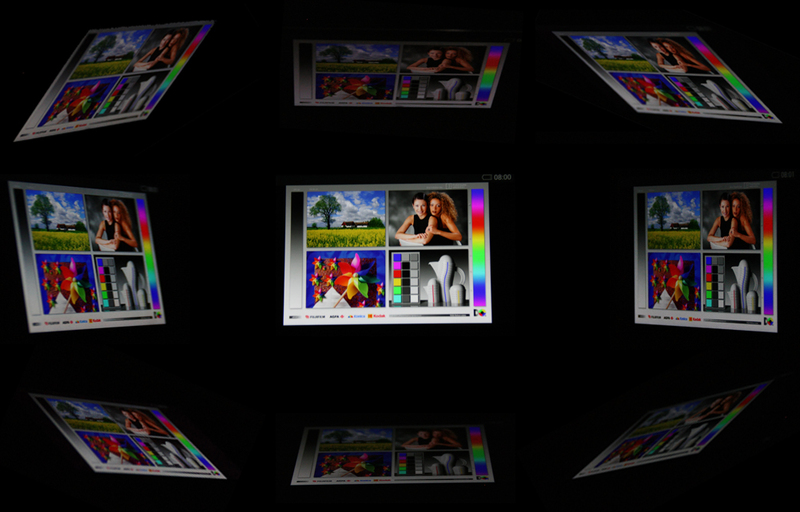 However, if you are looking for strong colors, you should get a smartphone with an AMOLED display. Here you get a more natural picture. An Infrared sensor is at the top and can be used to control TVs and other devices. It is a bold move from HTC to resist the MP race. And the camera is more than sufficient for users that primarily take pictures for their social media sites. 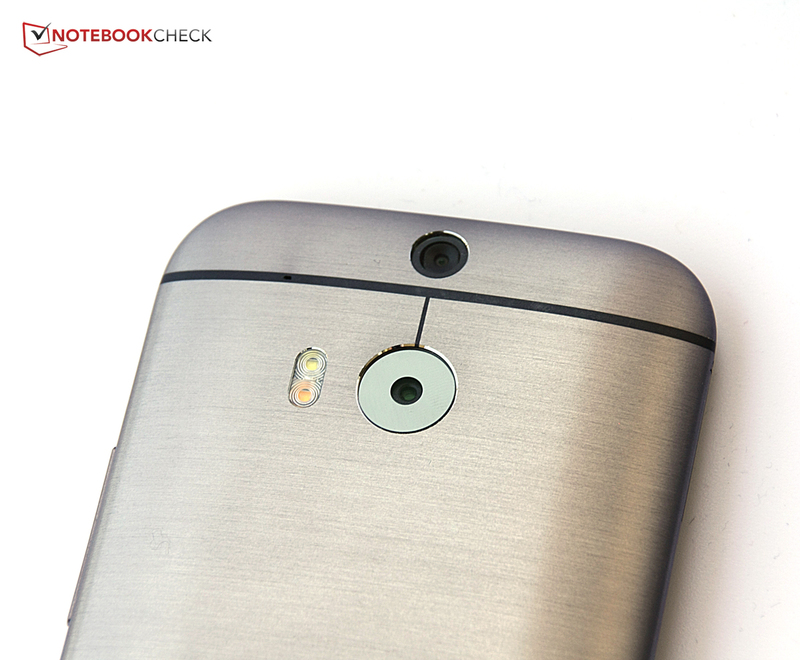 The metal chassis of the HTC One M8 creates a convenient haptics. 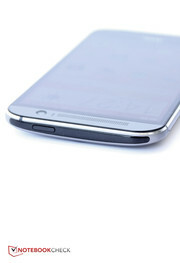 The silhouette is also very thin thanks to the curved shape. 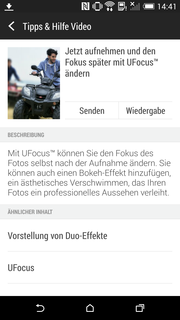 UFocus is HTC's application to control the focus in pictures of the main camera. HTC's Blinkfeed can be customized and also learns. 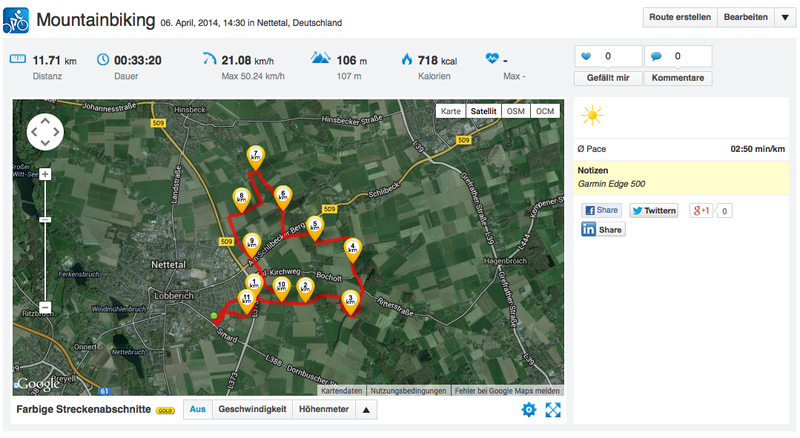 It can show news, social media messages as well as tips and tricks. Annoying, this message appeared after every app installation. Resistance useless. 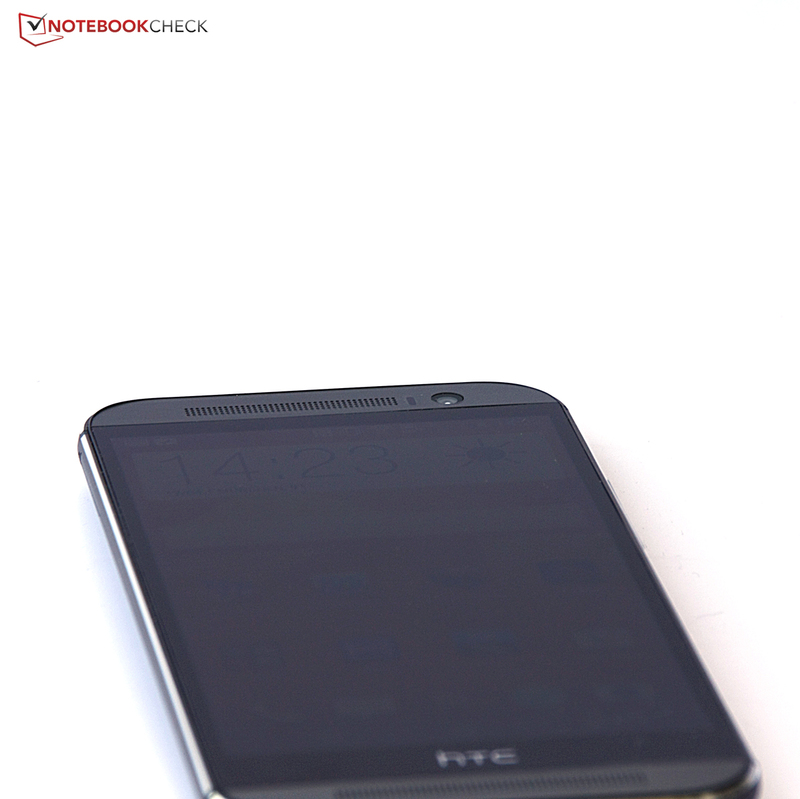 The energy-saving mode is a good feature and HTC even goes one step further if you want to. The extreme power-saver mode only activates the basic features. The result is long battery runtimes, even with a low battery charge. The current Android version is preloaded. 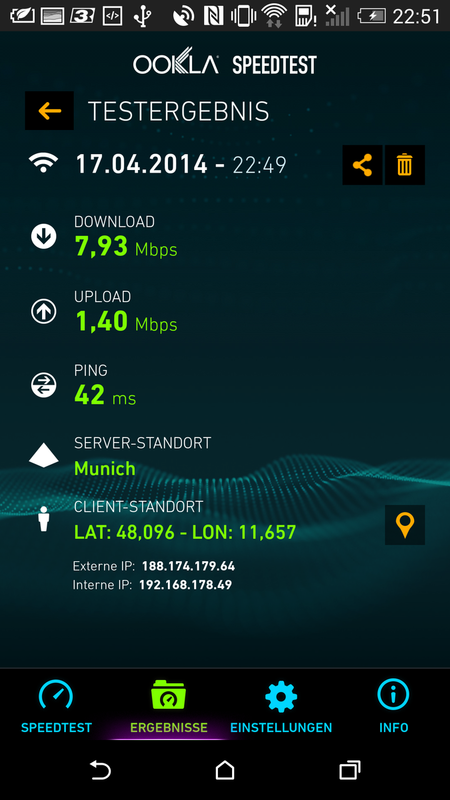 The WLAN module not only has a good signal, but can also use the full speed of an 8 Mbps connection. 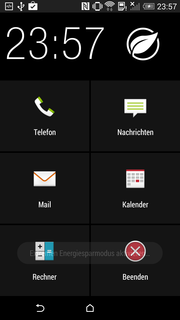 Some apps for mail, tasks and calendar are also provided by HTC. HTC also included a music app. A good way to test the speakers. Unfortunately, the Zoe app is not yet finished. 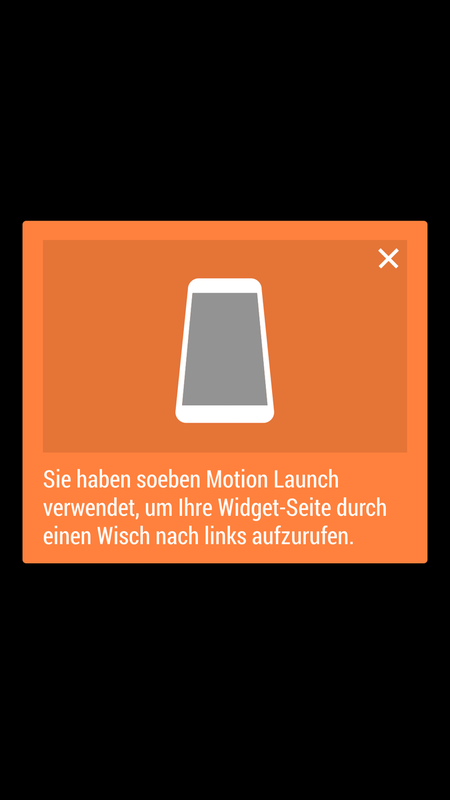 You can get to the home screen with a tap via Motion Launch. The rivals are already available. 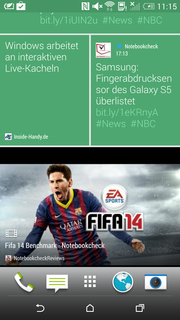 Samsung's Galaxy S5 is already in our editorial office. 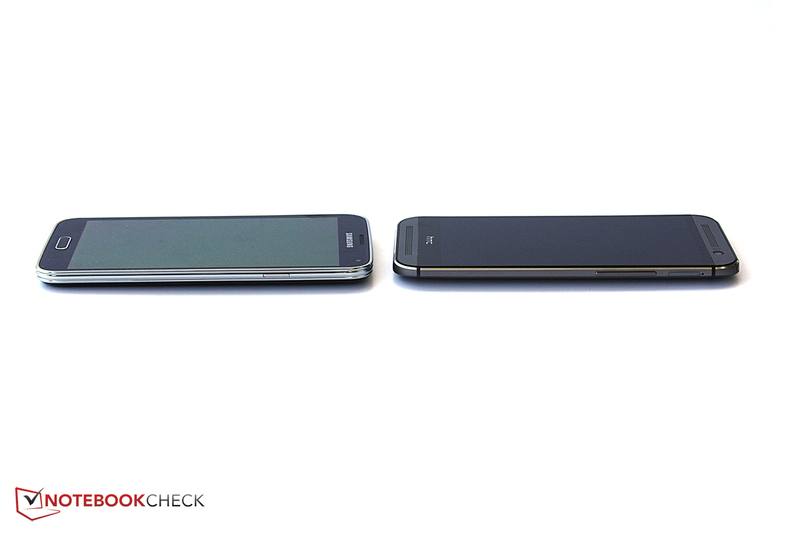 A first comparison of the two high-end smartphones. A comparison between the HTC One M8, Samsung Galaxy S5 and Sony Xperia Z will follow as well. The consistent development compared to the predecessor. Not everybody will be satisfied with the camera.